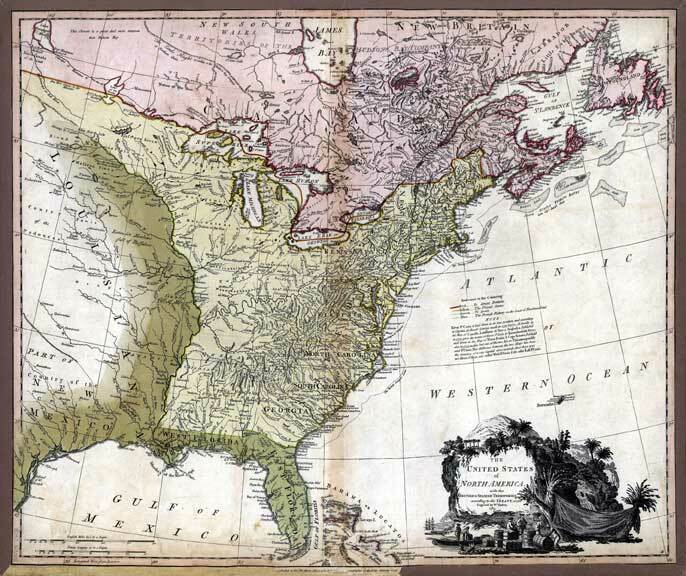 Also see other maps of the U.S. and North America in the Atlases section. 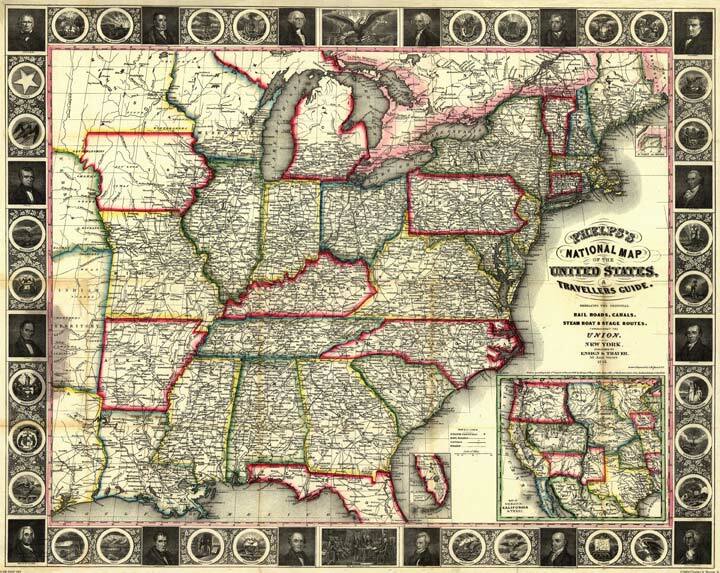 Some state maps are also in the Maps of the South section. 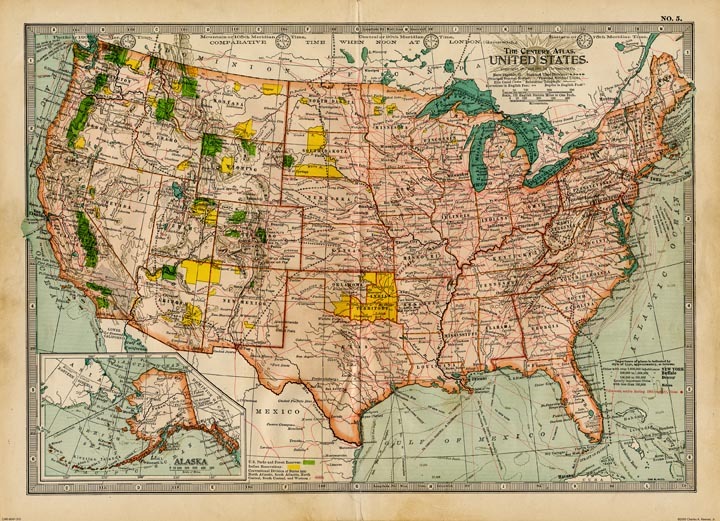 To purchase a map, just click on the Add to Cart button. 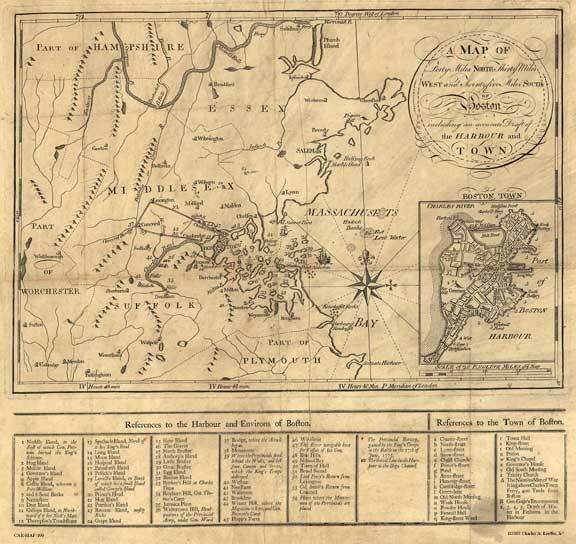 CAR-MAP-462 - Rivers of Tombecbe, Alabama, etc., Taitt, 1771? 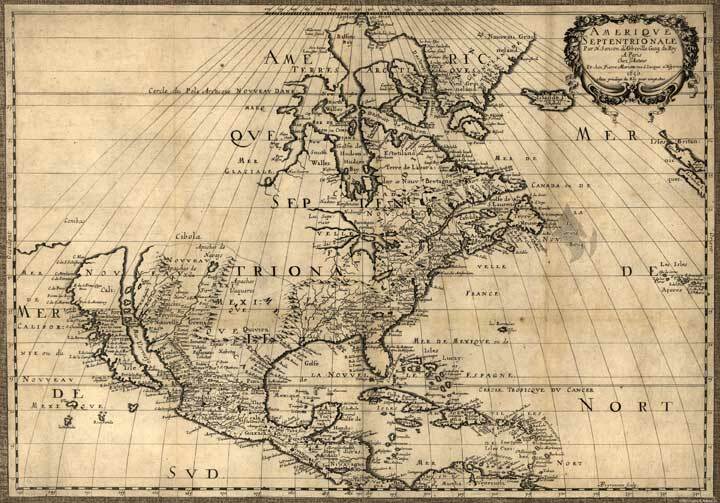 Americae sive qcaetae orbis partis... A very ornate Belgium map of the Americas. 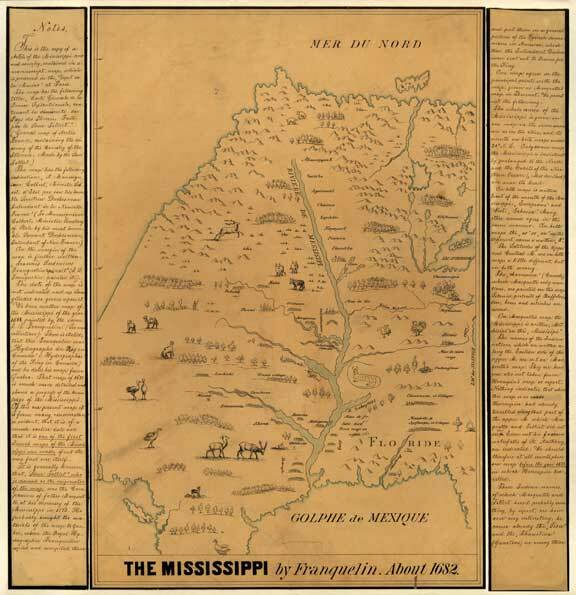 Created from a print at the Library of Congress Archives; 33" x 34"
North America; Sanson; 1650; from a copy at the Library of Congress Archives; 17" x 22"
Franquelin's Map of the Mississippi River; 1682; Created from a print at the Library of Congress Archives; 16"x 17"
Franquelin's Map of Louisiana (actually all of the U.S. as was known at the time). 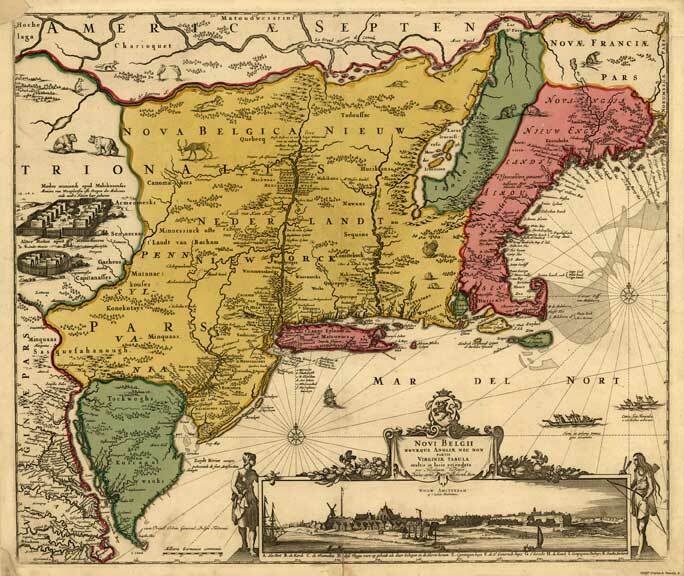 A reproduction of a map originally printed in 1684, this from a copy for Francis Parkman, 1896. 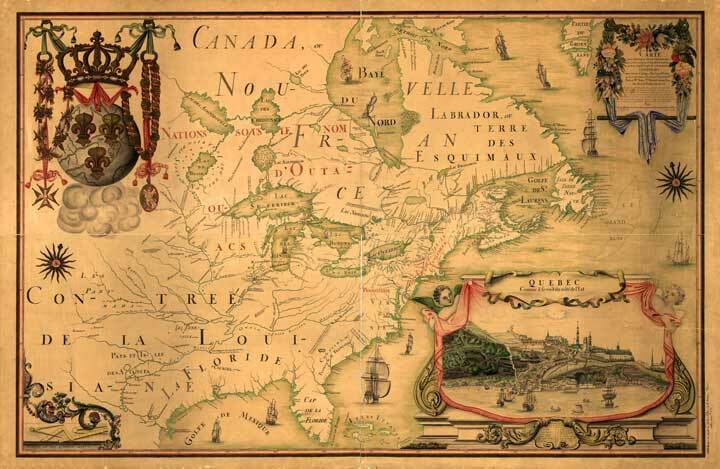 Created from a print at the Library of Congress Archives; 24" h x 30" w.
Northeast America; Visscher; 1685; from a copy at the Library of Congress Archives; 17" x 22"
Franquelin's North America. 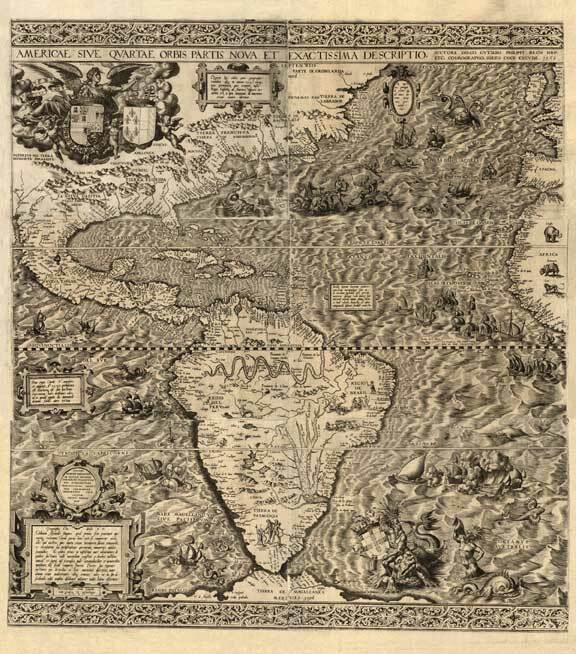 A reproduction of a map originally printed in 1688, this copy created 1909. 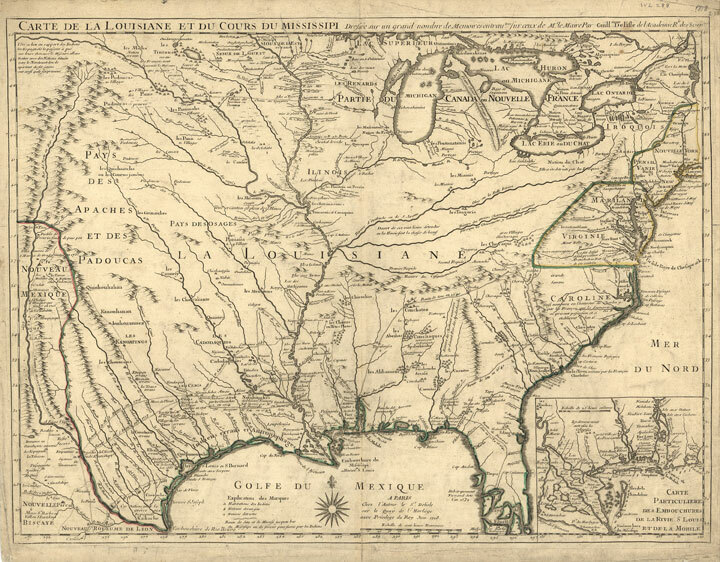 Created from a print at the Library of Congress Archives; 41" h x 62" w.
Dominion of Great Britain in North America; Moll; 1715; from a copy at the Library of Congress Archives; 40" h x 24" w.
Carte de la Louisiana... a map of the southern states; L'Isle; 1718. 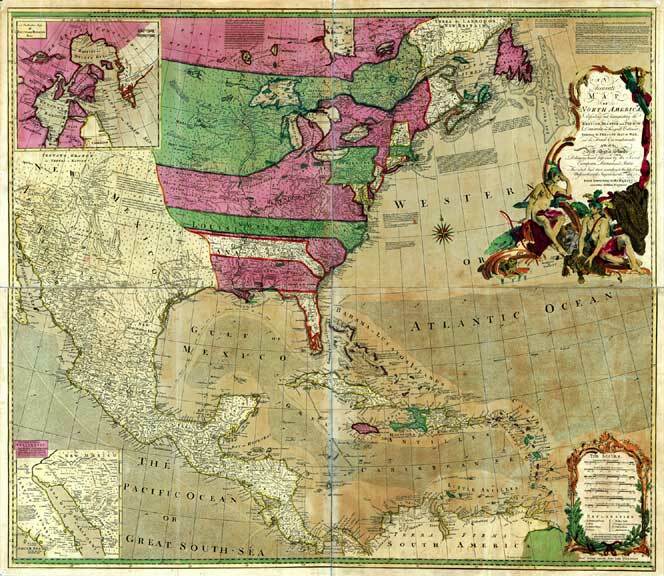 Created from a print at the Library of Congress Archives; 19" x 25"
Carta Geografica dell' America Settentroionale; an early map covering North America, Central America and the Caribbean Islands; created from a print at the Library of Congress Archives; Guillaume de L'Isle;1750; 11" h x 13" w, printed 17" h x 22" w.
A map of the most inhabited part of Virginia containing the whole province of Maryland with part of Pensilvania, New Jersey and North Carolina; Joshua Fry & Peter Jefferson, 1751. 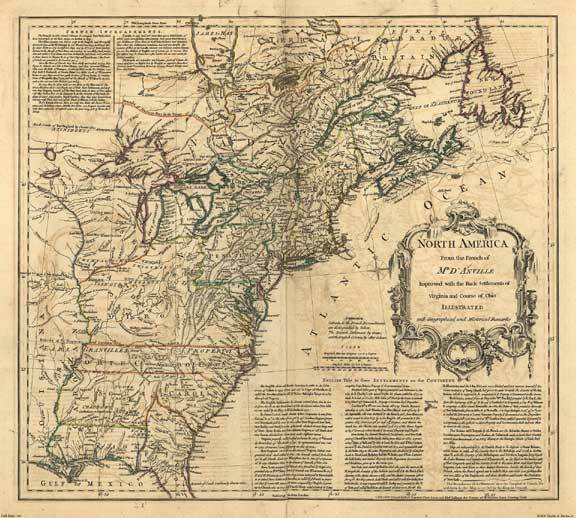 Created from a print at the Library of Congress Archives; 30" h x 48" w.
Map of the British American plantations; Emanuel & Thomas Bowen; 1754; from a copy at the Library of Congress Archives; 20" x 16"
Map of the British & French dominions in North America; John Mitchell; 1755; one of the most significant and detailed early maps showing the area that formed the United States; from a copy at the Library of Congress Archives; 42" x 60" (original size 54" x 77"). 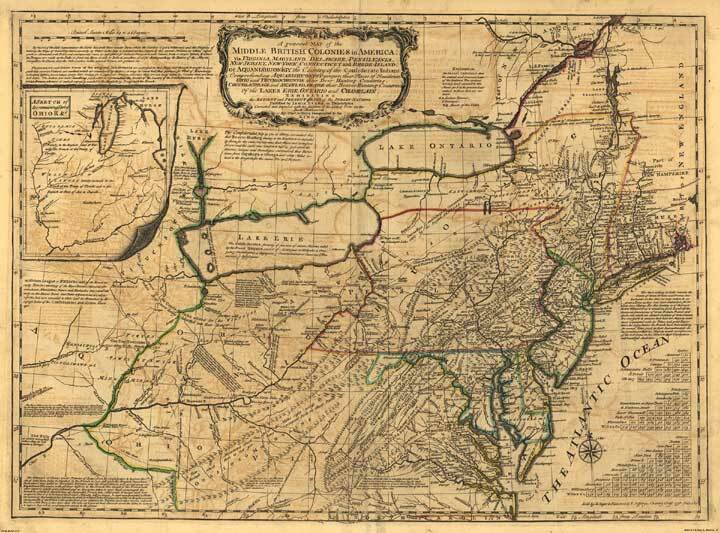 A General map of the Middle British Colonies in America; Lewis Evans; 1771; from a copy at the Library of Congress Archives; 19" x 26"
North America; Jefferys; 1771; from a copy at the Library of Congress Archives; 31" h x 23" w.
North America; Peter Bell; 1771; from a copy at the Library of Congress Archives; 17" x 24"
Rivers of Tombecbe, Alabama, Tensa, Perdido & Scambia...; David Taitt; 1771? 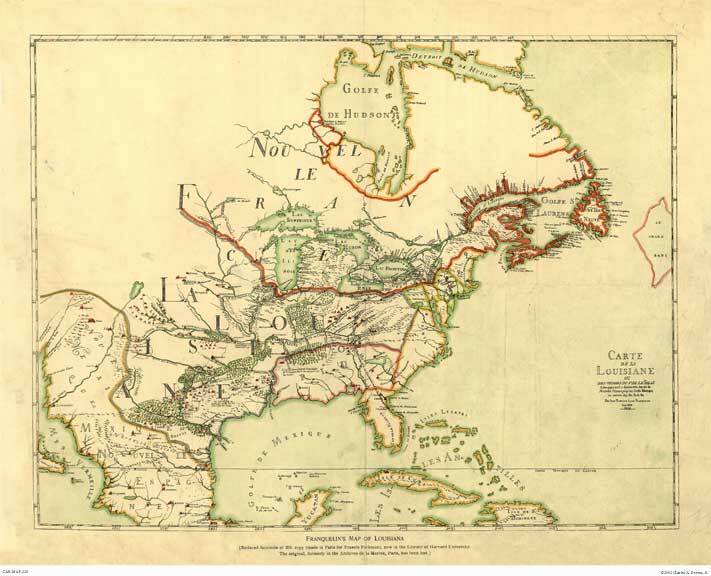 ; from a copy at the Library of Congress Archives; 28" x 32"
British Colonies In North America; Jefferys; 1771; from a copy at the Library of Congress Archives; 31" h x 23" w.
An accurate map of North America, describing the British, Spanish, and French dominions; Emanuel Bowen 1775?. 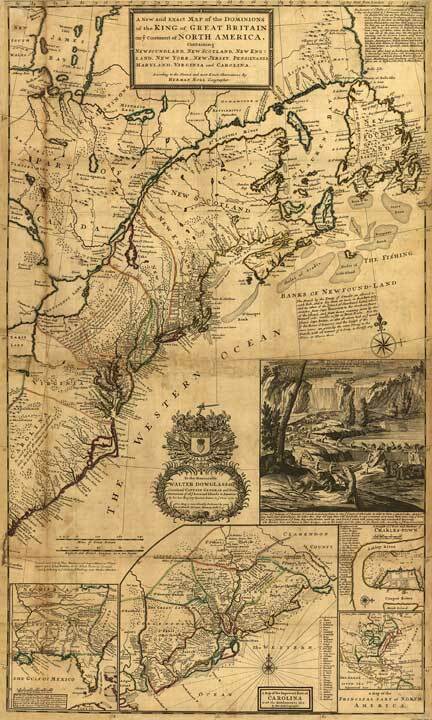 Created from a print at the Library of Congress Archives; 40" h x 36" w.
Boston and Surrounding Area; 1775. 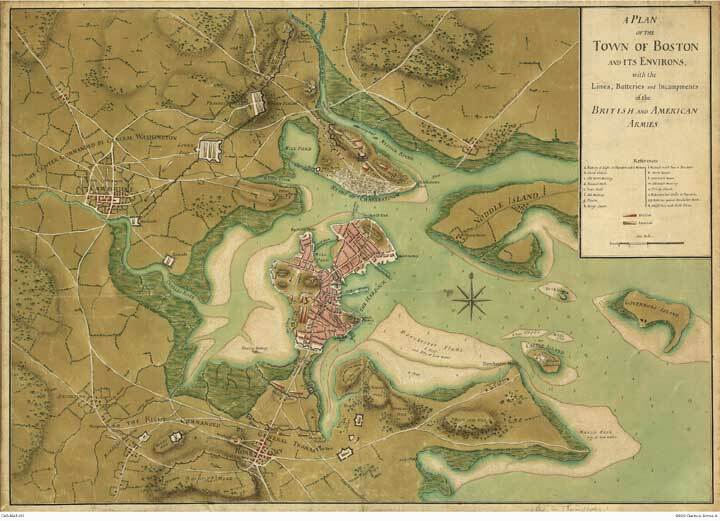 Created from a print at the Library of Congress Archives; 12" h x 17" w.
Boston and Surrounding Area; De Costa; 1775. 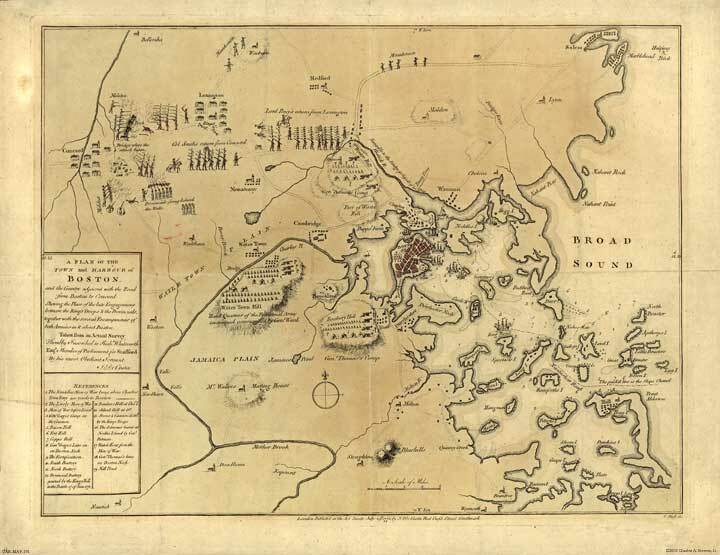 Created from a print at the Library of Congress Archives; 12" h x 17" w.
A Plan of Boston and its Environs...; Thomas Hyde Page; 1776; from a copy at the Library of Congress Archives; 18" x 25"
North America; Carver; 1778; from a copy at the Library of Congress Archives; 17" h x 22" w.
An Accurate Map of the United States of America, with part of the surrounding provinces agreeable to the Treaty of Peace of 1783; a very early map. 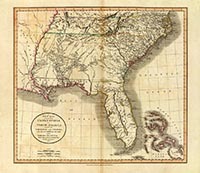 Published by J. Cary, 1783. 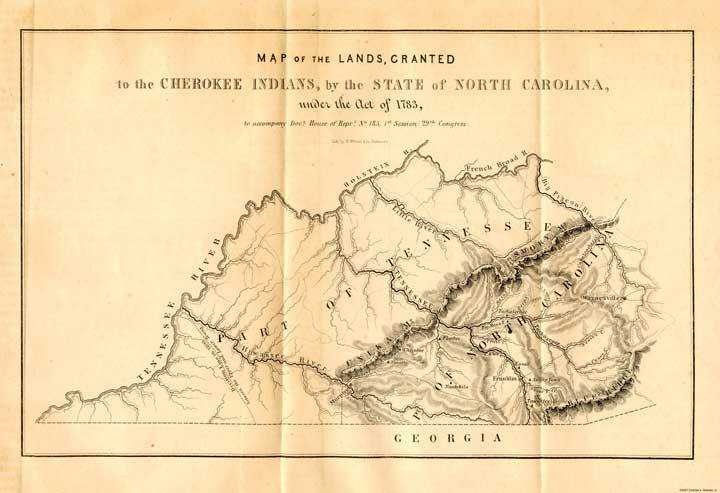 Created from a print at the Library of Congress Archives; 23" h x 26" w.
Cherokee Lands Ceded to North Carolina Under the Act of 1783; this map published 1846; 17" x 22"
A Map of the United States of America; with part of the adjoining provinces; By Thomas Conder and Robert Wilkinson;1791. 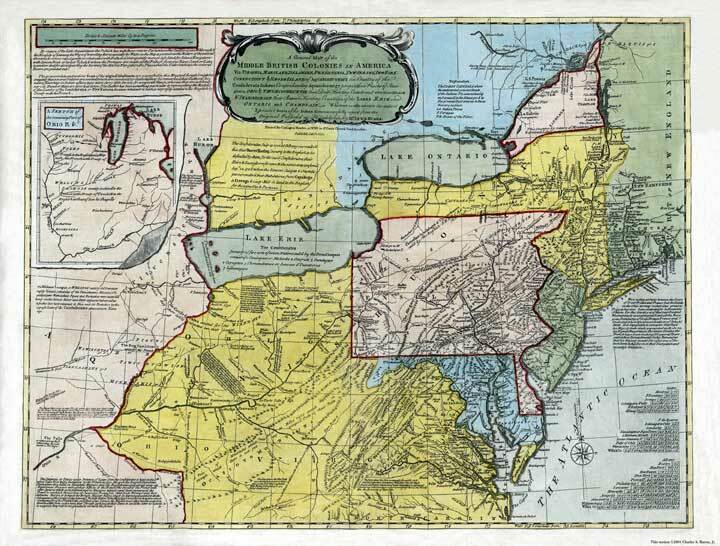 Created from a print at the Library of Congress Archives; 16" h x 20" w.
1776 - Map of the Original Thirteen Colonies; John Mitchell; 1881. 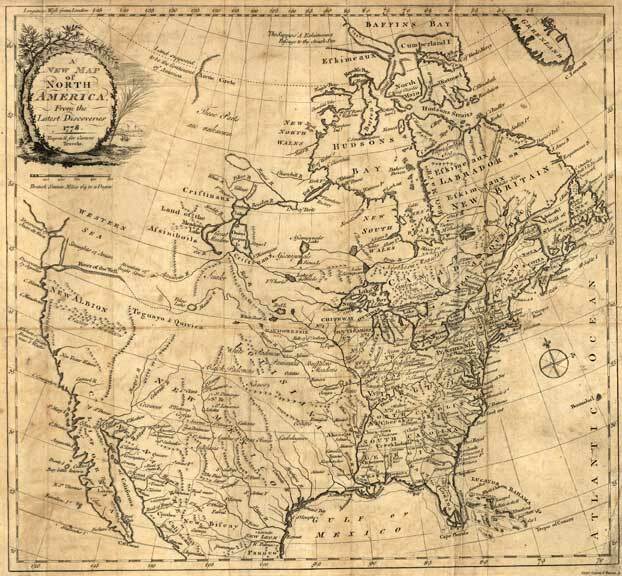 Created from an original copy; 16" h x 19" w.
The United States of North America...according to the treaty of 1784; William Faden; 1785. 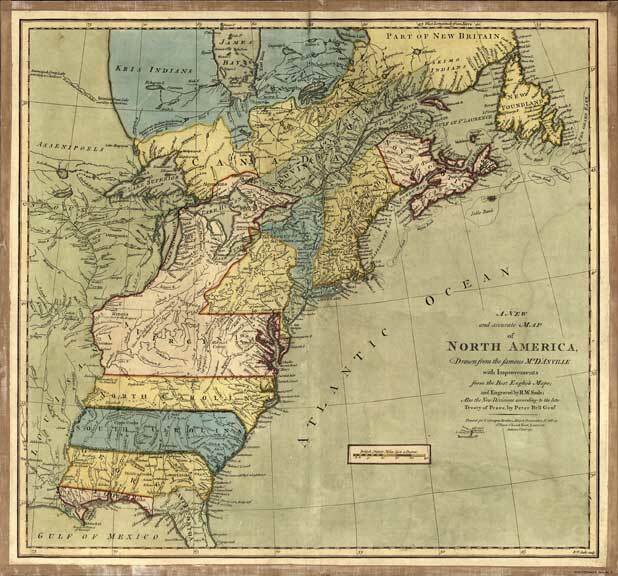 Created from a print at the Library of Congress Archives; 21" x 25"
The Central Area of the United States; French; By Rigobert Bonne and Petter Andre; 1788. 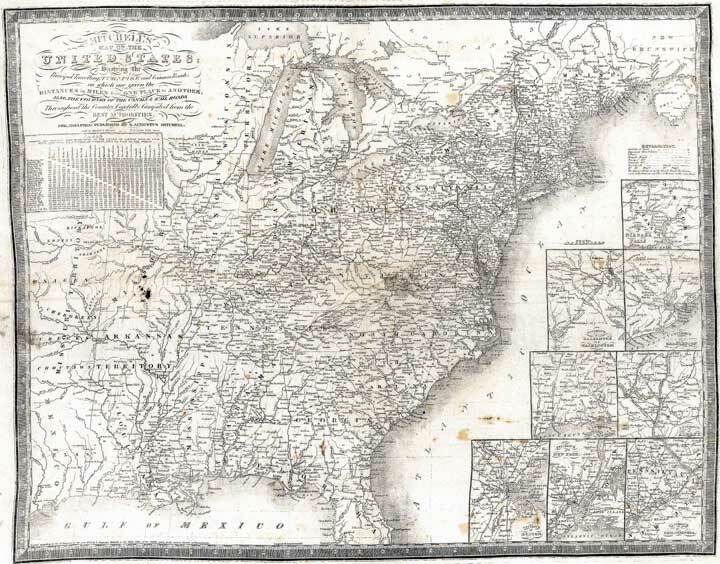 Created from a print at the Library of Congress Archives; 21" h x 15" w.
A map of the United States exhibiting post roads & distances; Abraham Bradley Jr.; 1796. 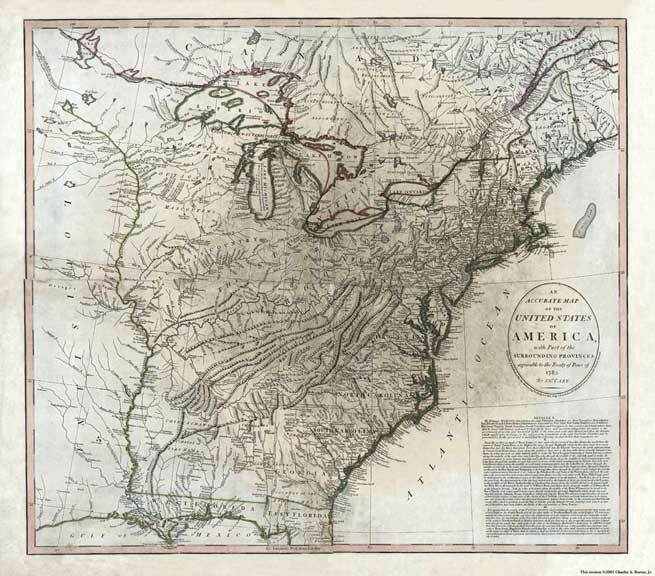 Created from a print at the Library of Congress Archives; 36" x 34"
A Map Exhibiting all the New Discoveries in the Interior Parts of North Americaz; Arrowsmith; 1802. 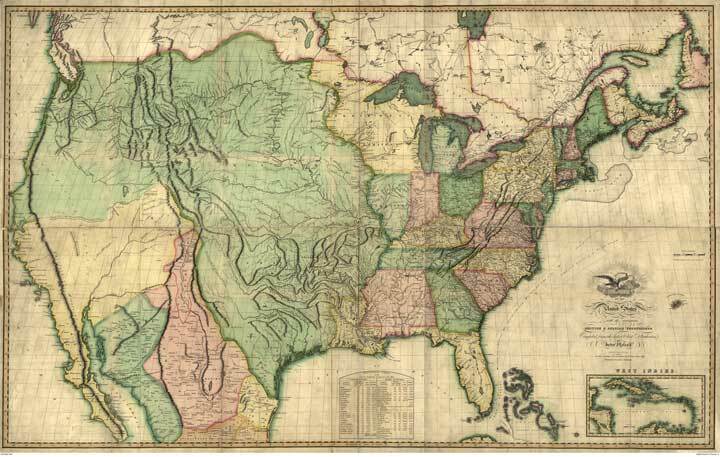 Created from a print at the Library of Congress Archives; 42" x 49"
The Central Area of the United States; (French); Poirson; 1803. 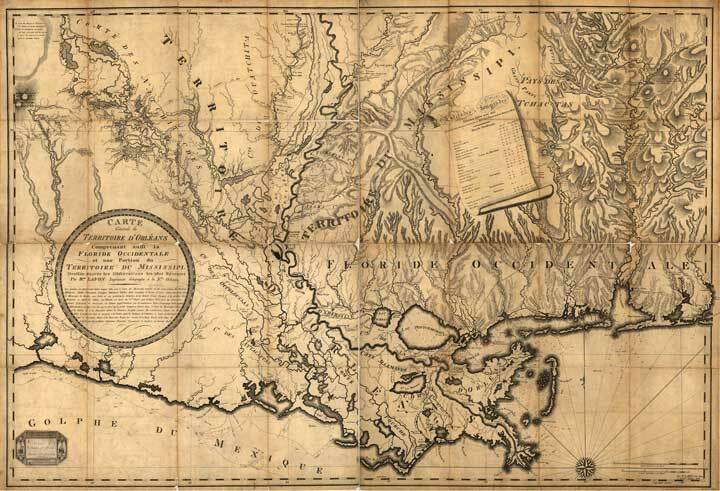 Created from a print at the Library of Congress Archives; 20" h x 16" w.
The Area Around New Orleans; (French); Lafon; 1806. 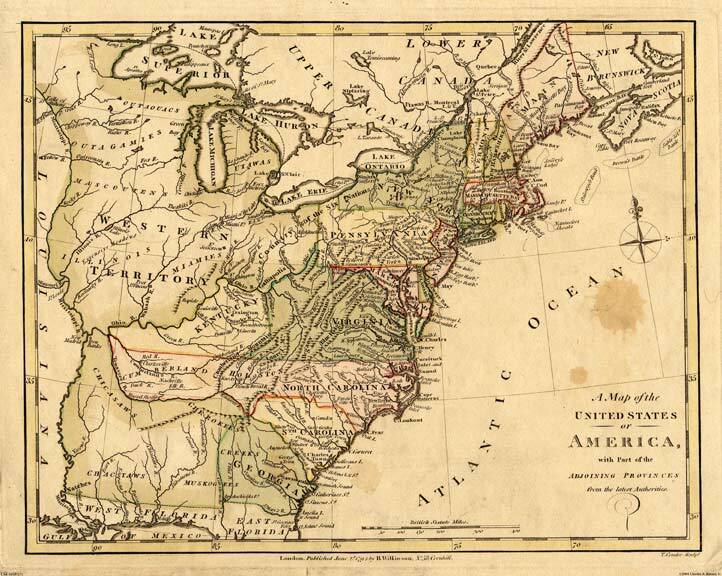 Created from a print at the Library of Congress Archives; 36" x 52"
The SE United States; Mathew Carey; 1806. 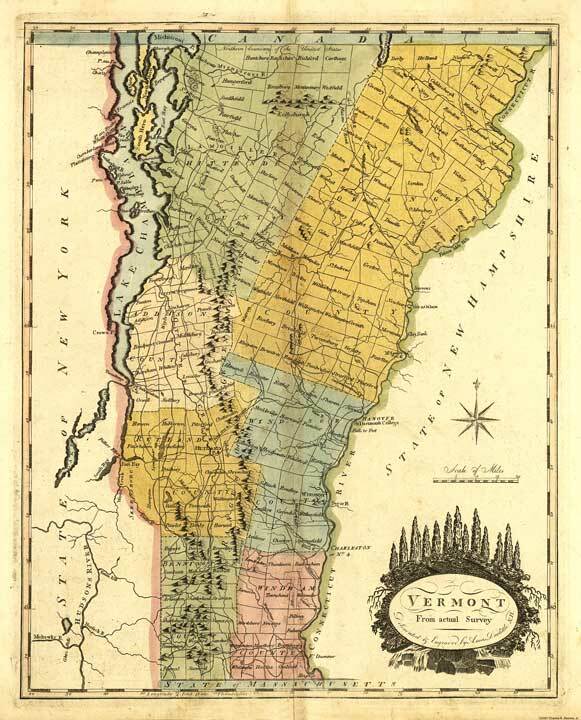 16" x 20"
Vermont; Mathew Carey; 1814. 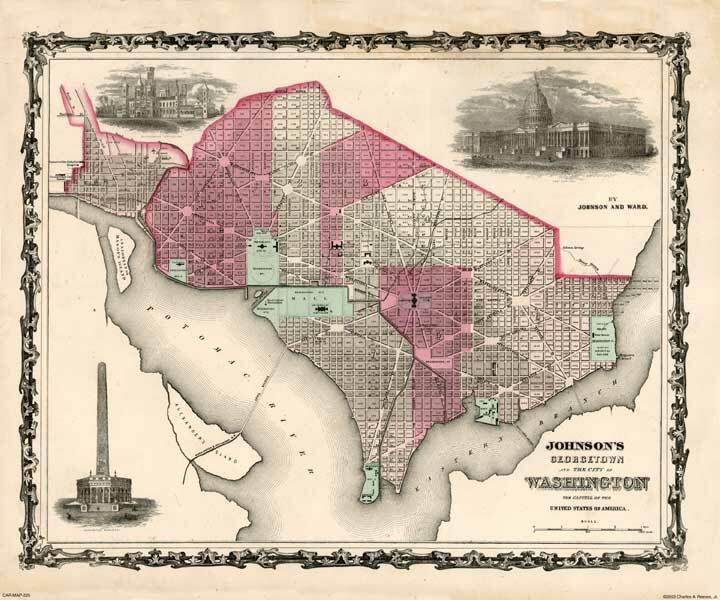 Created from a print at the Library of Congress Archives; 17" x 22". 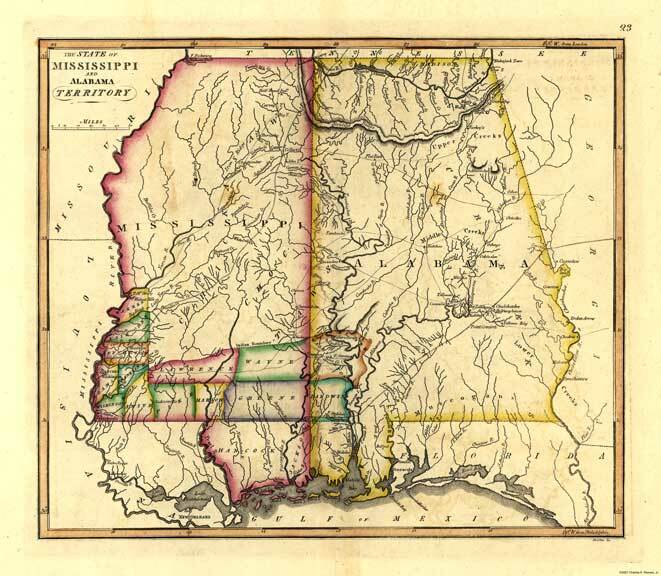 The State of Mississippi & Alabama Territory; Mathew Carey; 1814. 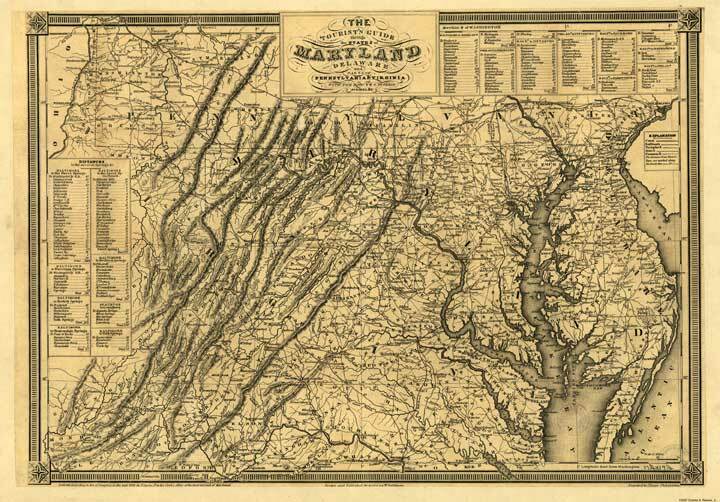 Created from a print at the Library of Congress Archives; 17" x 22". 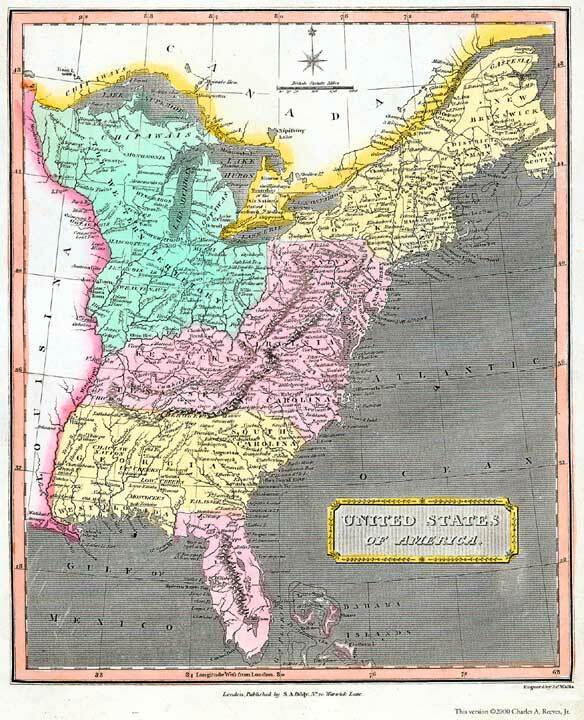 United States of America; from General Atlas, published by James Wallis in London in 1911. 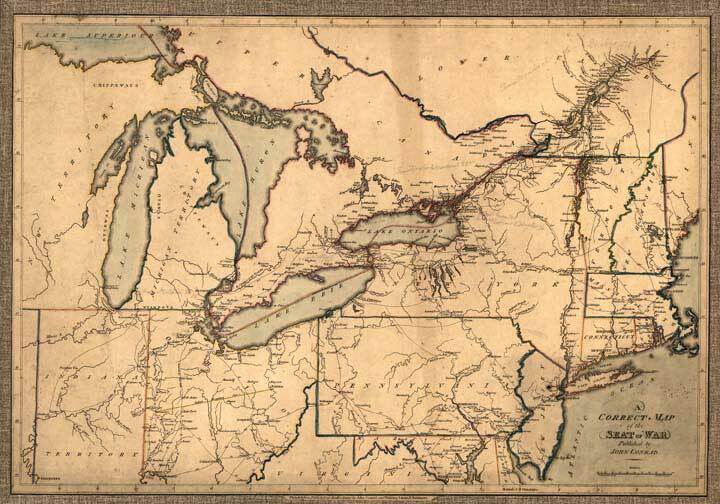 Created from an original copy; original size, 8" x 10", printed 17" h x 22" w.
A Map of The War of 1812; John Conrad & Samuel Lewis, 1812. 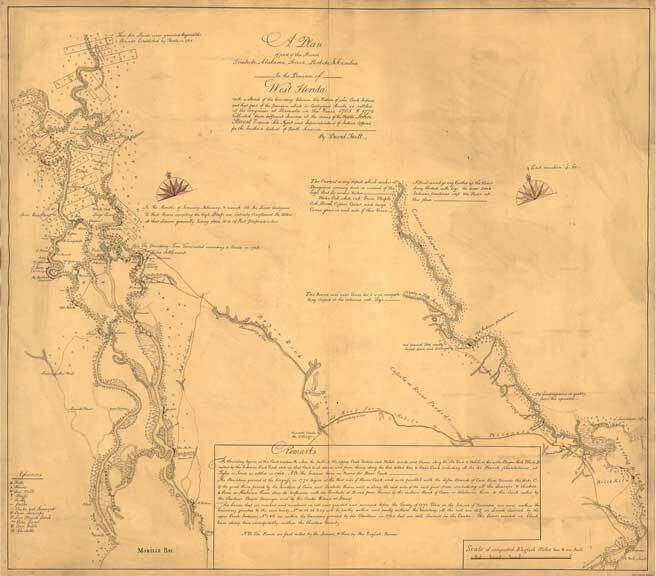 Created from a print at the Library of Congress Archives; 15" x 21"
A Map of Lewis & Clark's Track; Samuel Lewis, 1814. 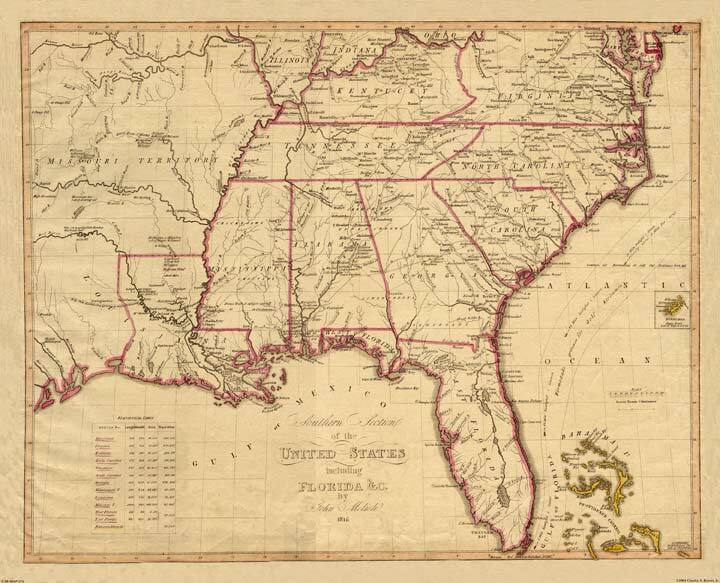 Created from a print at the Library of Congress Archives; 12" x 28"
Southern section of the United States, including Florida &c; John Melish; 1816; from a copy at the Library of Congress Archives; 16" h x 19" w.
A Map of the United States of America; By John Melish & Henry Tanner;1816. 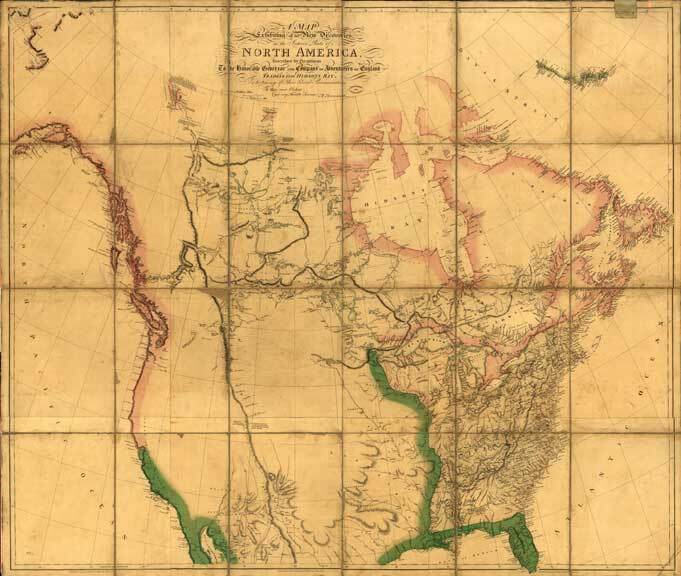 Created from a print at the Library of Congress Archives; 35" h x 57" w.
The route of the Santa Fe Trail; Joseph C. Brown; 1825; from a copy at the Library of Congress Archives; 14" h x 48" w.
A Map of North Americaa, including all the recent geographical discoveries; V. H. Vance; 1826; from a copy at the Library of Congress Archives; 21" h x 17" w.
Pennsylvania; Finley; 1829; from a copy at the Library of Congress Archives; 17" x 22"
Tanner's Map of the United States; showing canals and railroads; Henry Tanner; 1830; from a copy at the Library of Congress Archives; 17" h x 22" w.
Massachusetts, Connecticut & Rhode Island; James H. Young; 1831; from a copy at the Library of Congress Archives; 17" h x 22" w.
Tanner's Map of the United States; Henry Tanner; 1835; from a copy at the Library of Congress Archives; 17" w x 22" h.
Pennsylvania & New Jersey; Thomas Bradford; 1835; from an original copy; 17" w x 22" h., about twice the original size. 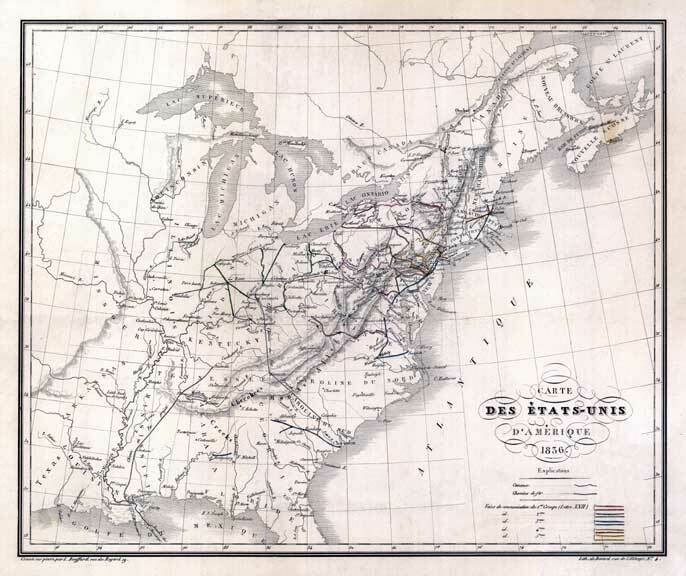 Carte des Etas-unis dAmerique. 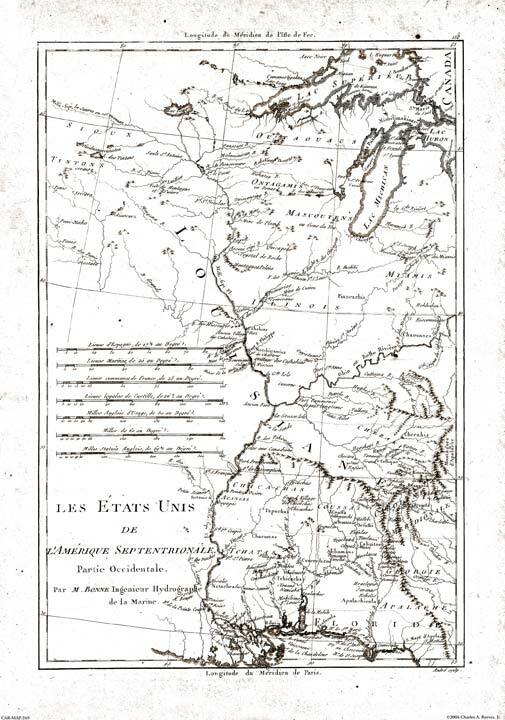 Gravee sur pierre par L. Bouffard; a French map of the Eastern U.,S. published by Bernard; 1836. 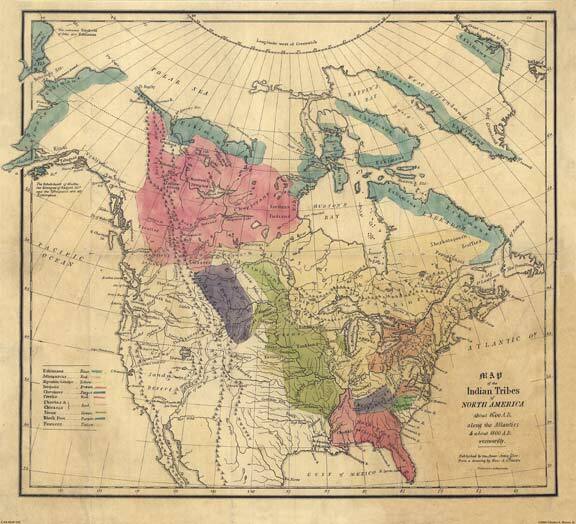 Created from a print at the Library of Congress Archives; 17" h x 22" w.
A Map of the Indian Tribes of North Americaa, about 1600 A.D.; Albert Gallatin; 1836; from a copy at the Library of Congress Archives; 15" h x 17" w.
Mitchell's Map of the United States; showing the principal traveling turnpike and common roads; includes insets of Niagara Falls, Baltimore and Washington, Charleston, Hardford and New Haven, Albany, Boston, New York, and Philadelphia; 1836. 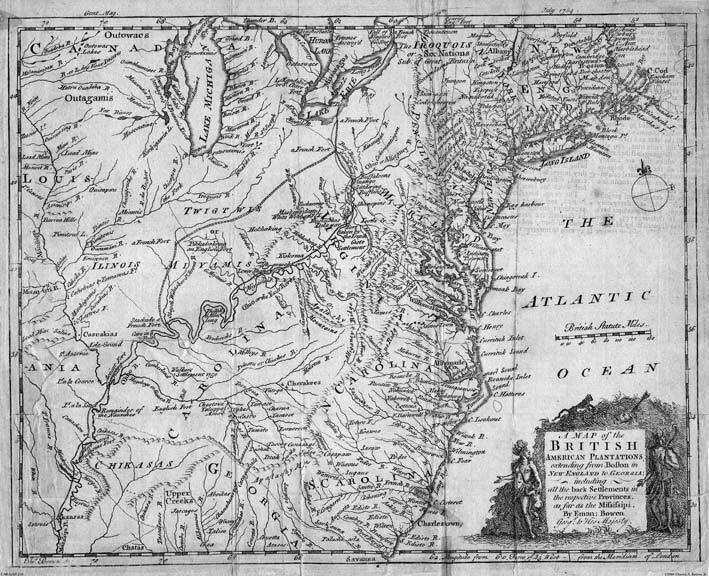 Created from a print at the Library of Congress Archives, but it is of poor quality making it difficult to read; 24" h x 26" w.
Tourist's Guide to Maryland, Delaware and Part of Pennsylvania & Virginia; Fielding Lucas; 1836; from a copy at the Library of Congress Archives; 17" h x 22" w.
A new map of Texas, Oregon & California; S. A. Mitchell; 1846; from a copy at the Library of Congress Archives; 21" h x 23" w.
Map of the United States, the British Provinces, Mexico &c; John M. Atwood; created from a print at the Library of Congress Archives; 1849; 16" h x 22" w.
Mitchell's New Traveler's Guide Through the United States; showing railroads, canals, stage roads; published by Cowperwaith & Co.; 1853. 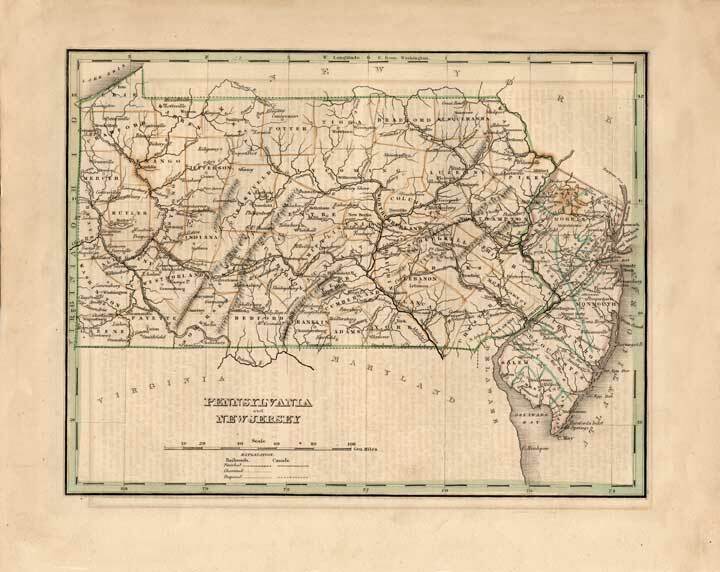 Includes county maps of Virginia and North Carolina, Pennsylvania, 27" h x 36" w.
Colton's railroad & township map, western states; J.H. Colton. 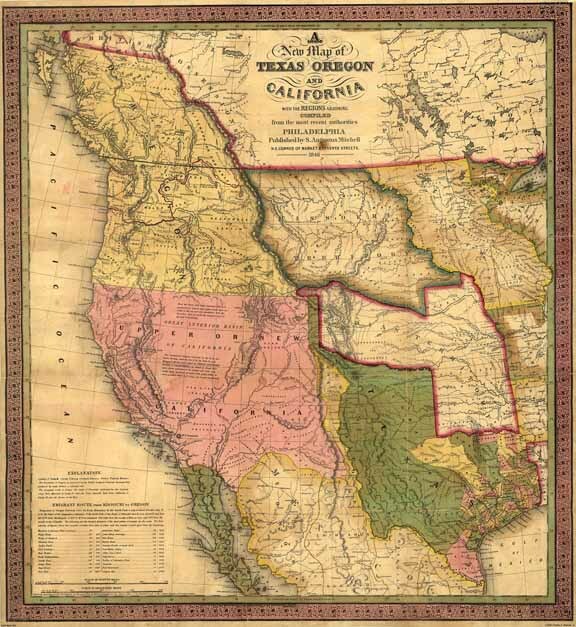 ; 1853. 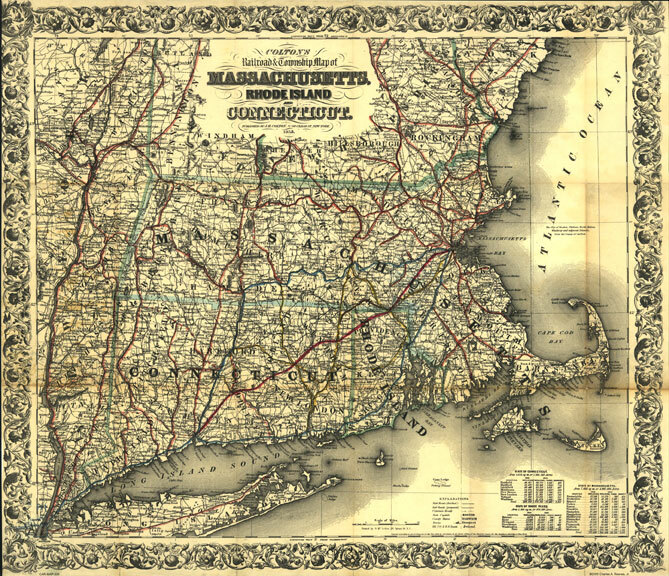 Created from a print at the Library of Congress Archives, 34" h x 45" w.
Colton's railroad & township map of Massachusetts, Rhode Island & Connecticut; J.H. Colton. 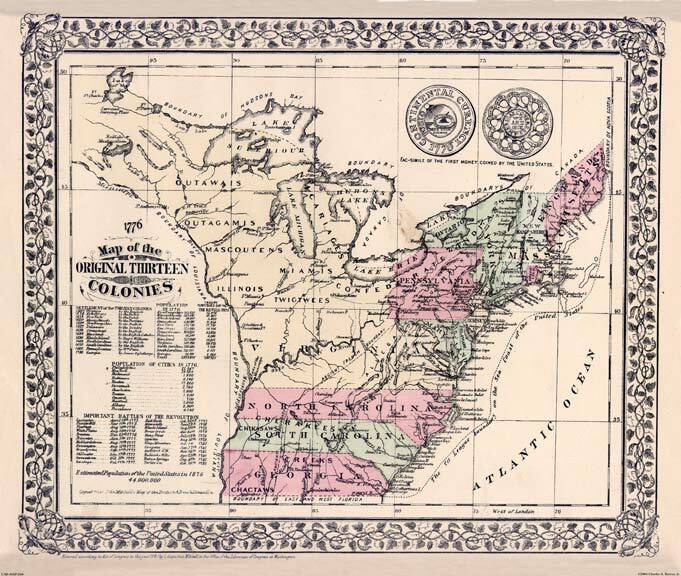 ; 1853. 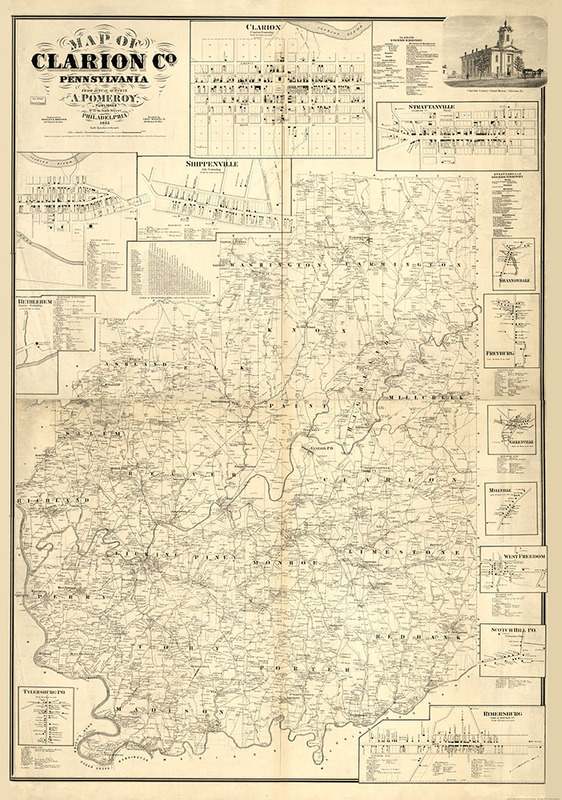 Created from a print at the Library of Congress Archives, 24" h x 28" w.
Colton's Railroad & Township of Ohio; G. W. Colton. ; 1854. 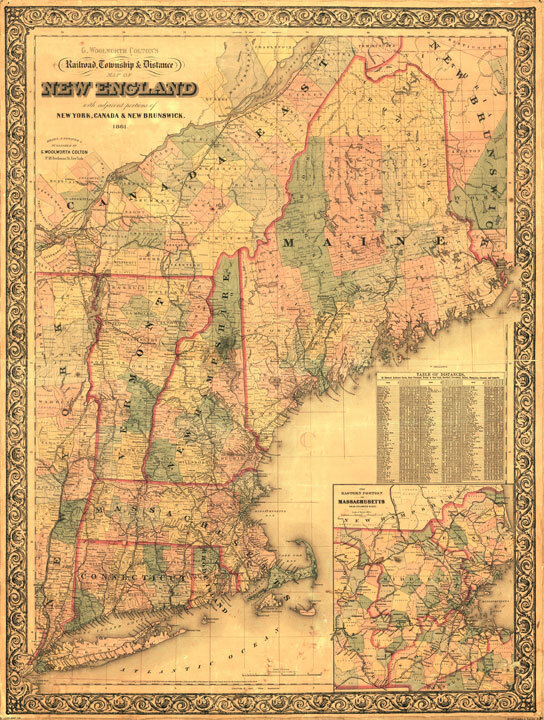 Created from a print at the Library of Congress Archives, 25" h x 29" w.
New England; Ensign, Bridgman & Fanning. 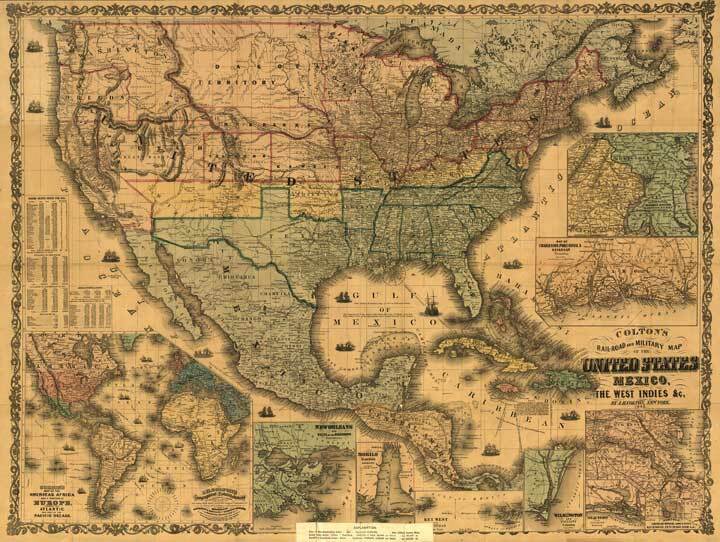 ; 1856. 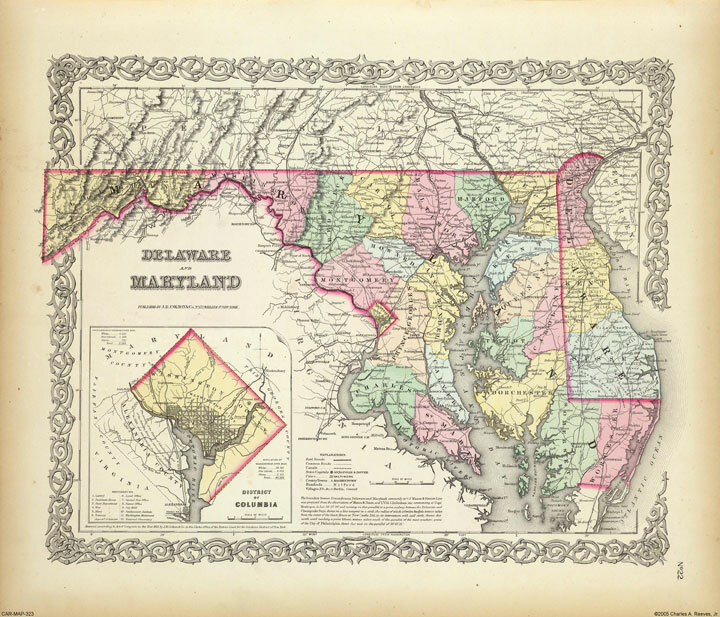 Created from a print at the Library of Congress Archives, 17" h x 22" w.
Colton's railroad & township map of Delaware & Maryland; J.H. Colton. 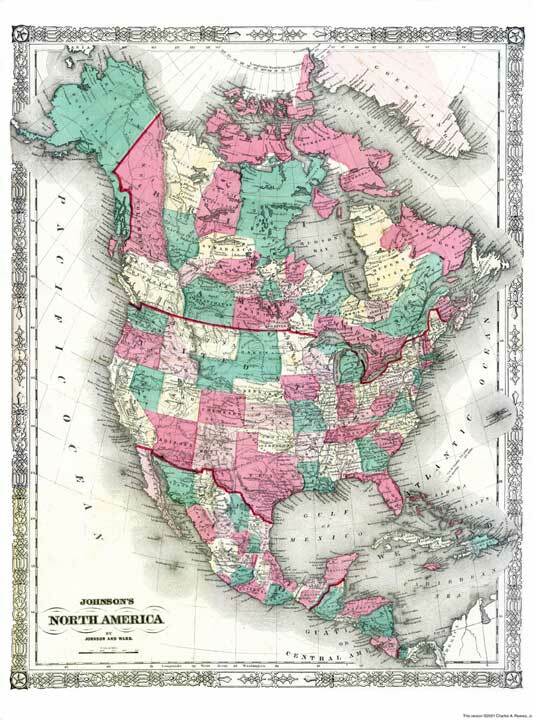 ; 1856. 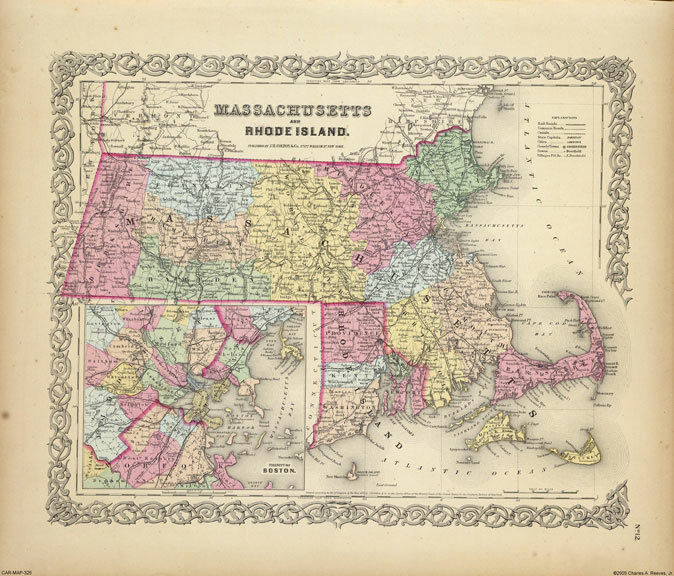 Created from an original copy, 19" h x 16" w.
Colton's Map of Massachusetts & Rhode Island; J.H. Colton. 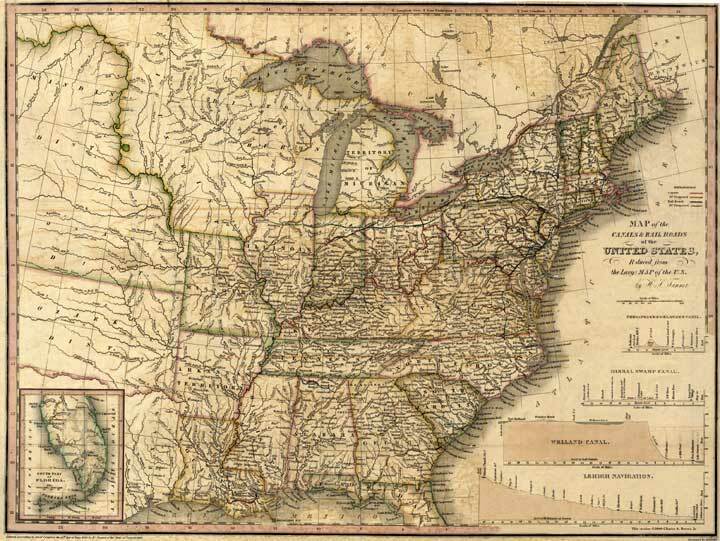 ; 1856. 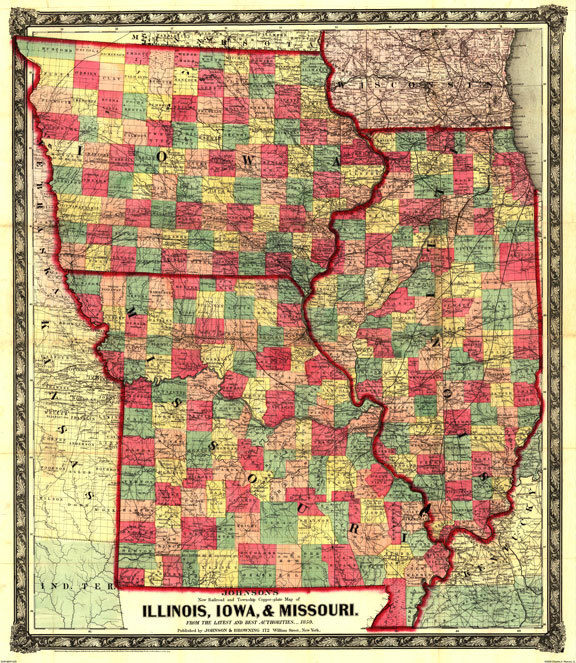 Created from an original copy, 16" h x 19" w.
Johnson's new railroad & township...map of Illinois, Iowa & Missouri...; A. J. Johnson; 1857. 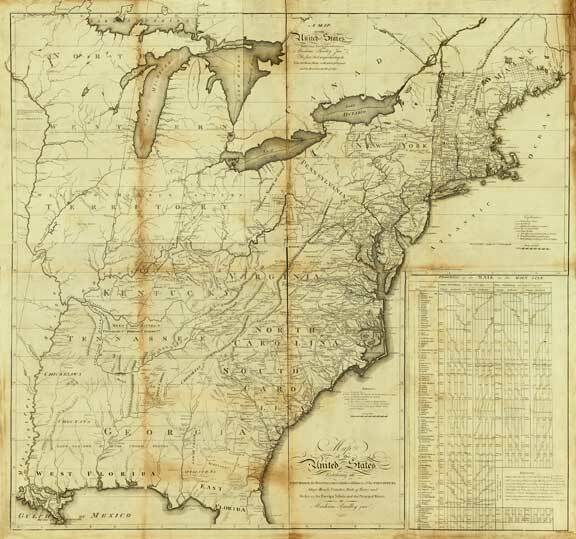 Created from a print at the Library of Congress Archives, 31" h x 26" w.
Map of the territory of the United States from the Mississippi River to the Pacific Ocean; ordered by Jeff' Davis, Secretary of War to accompany the reports of the explorations for a railroad route. 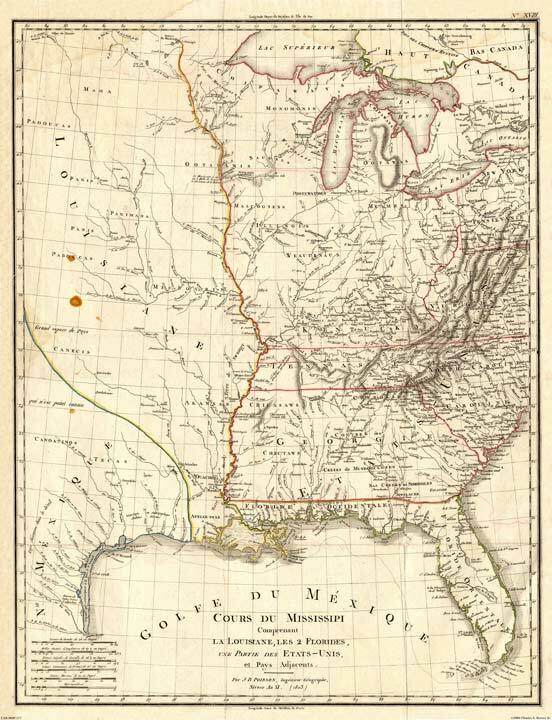 Compiled from authorized explorations and other reliable data by G. K. Warren ... under the direction of W. H. Emory in 1854 and of A. A. Humphreys 1854-5-6-7-8. 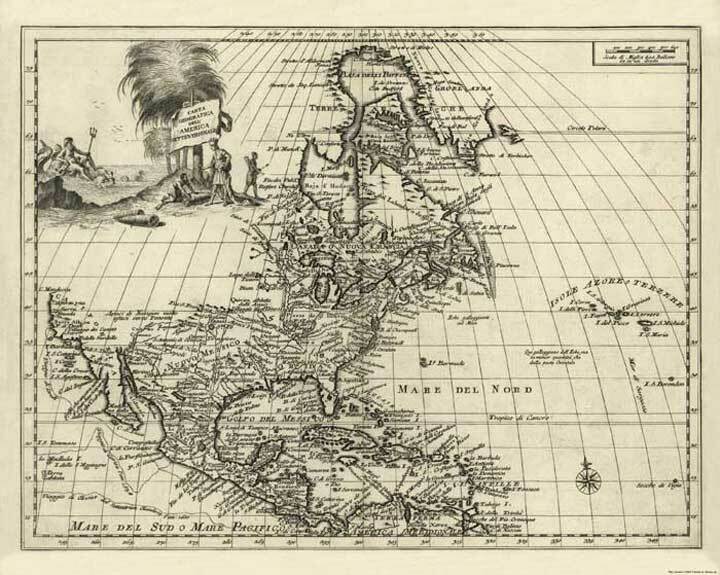 Drawn by E. Freyhold. Engr. on stone by J. Bien; G.K. Warren; 1858. 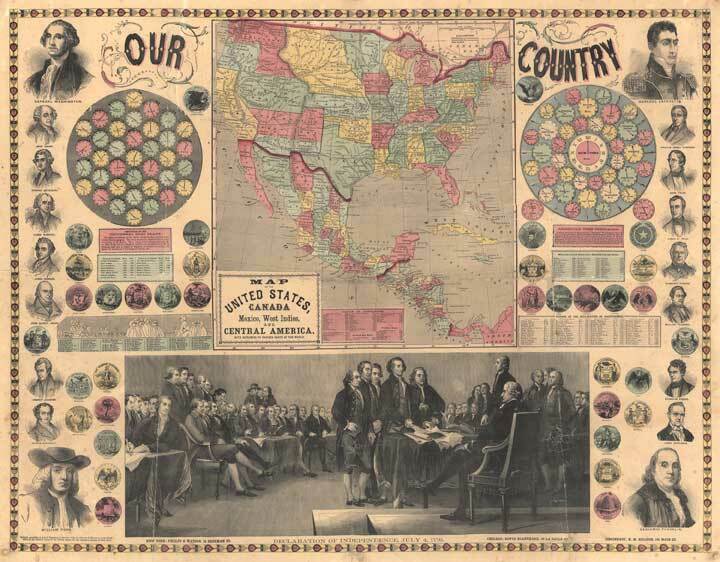 Created from a print at the Library of Congress Archives, 46" h x 42" w.
A Map of the United States of America; By Phelps & Watson;1859. 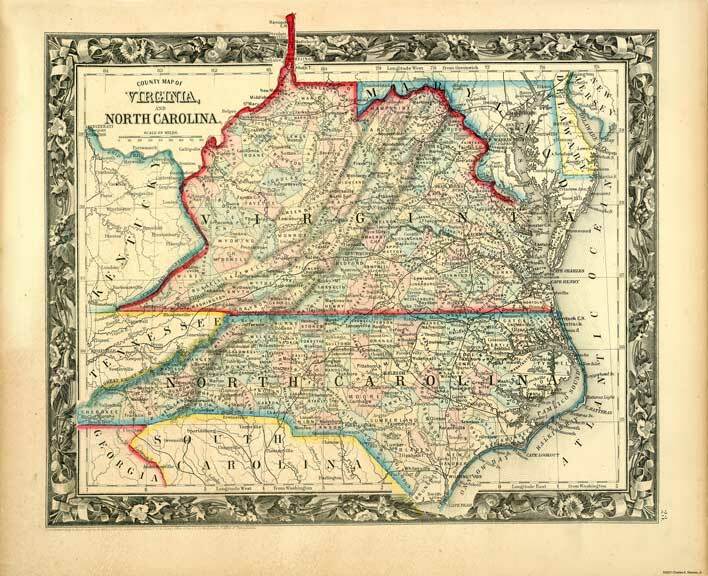 Created from a print at the Library of Congress Archives; 16" h x 21" w.
North Carolina & Virginia; Mitchell. 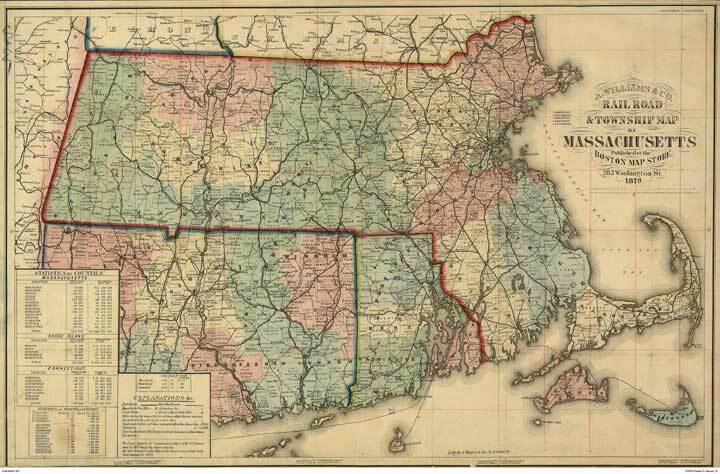 ; 1860. 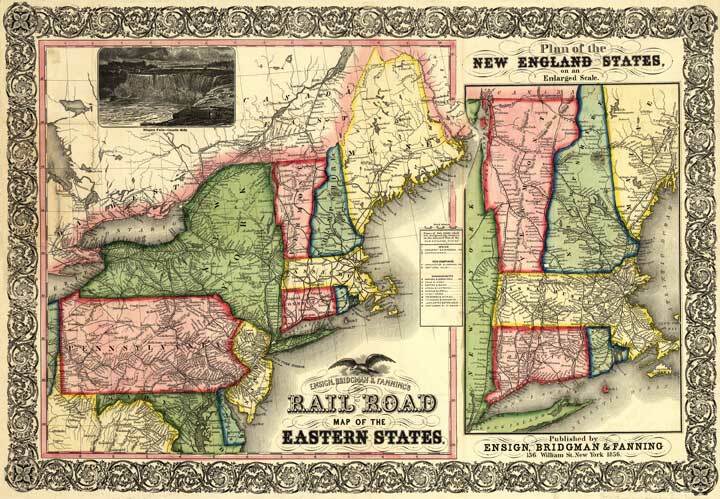 Created from a print at the Library of Congress Archives, 17" x 22"
Colton's railroad & township map of New England; J.H. Colton. 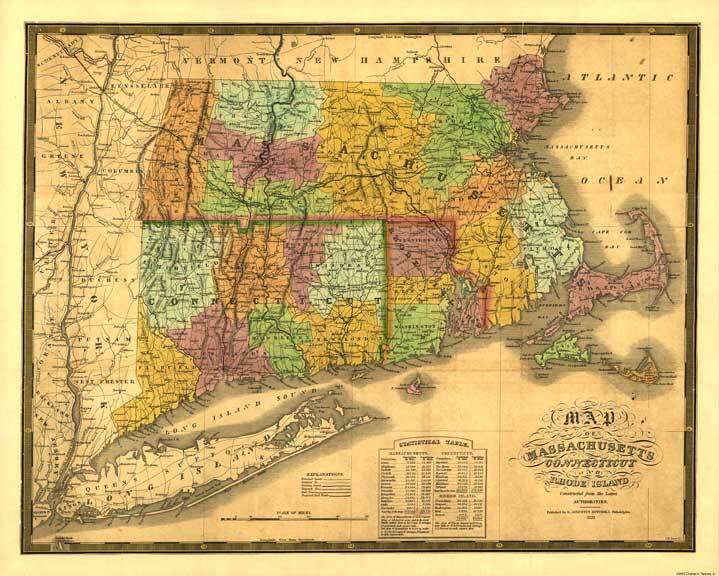 ; 1861. 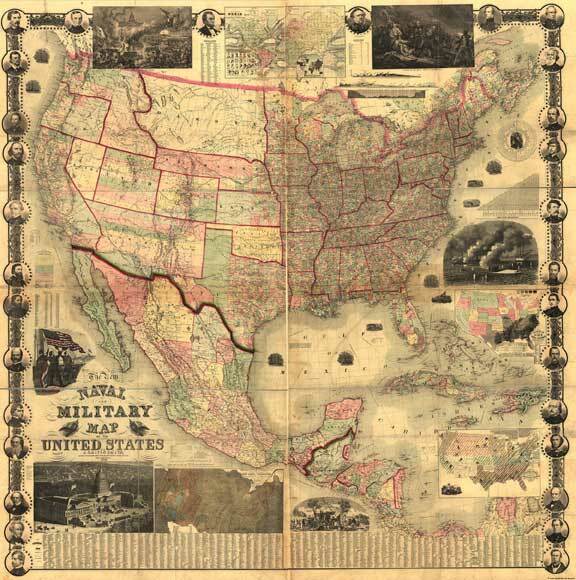 Created from a print at the Library of Congress Archives, 38" h x 28" w.
The New Naval and Military map of the United States; John C. Smith. 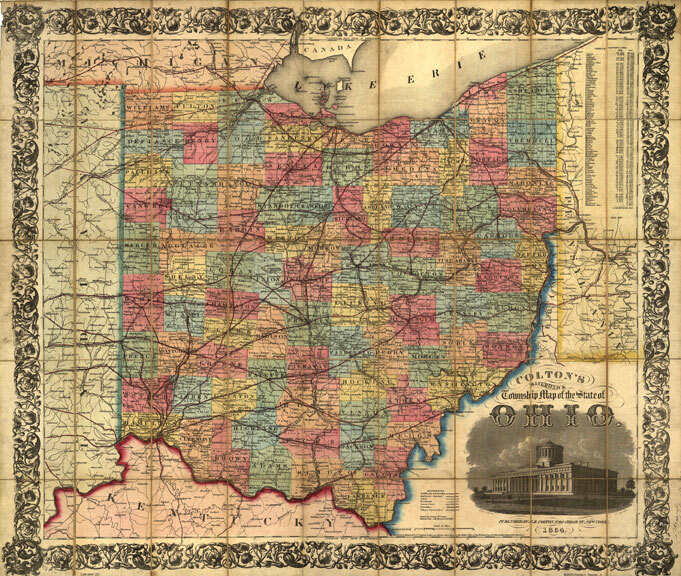 ; 1862. 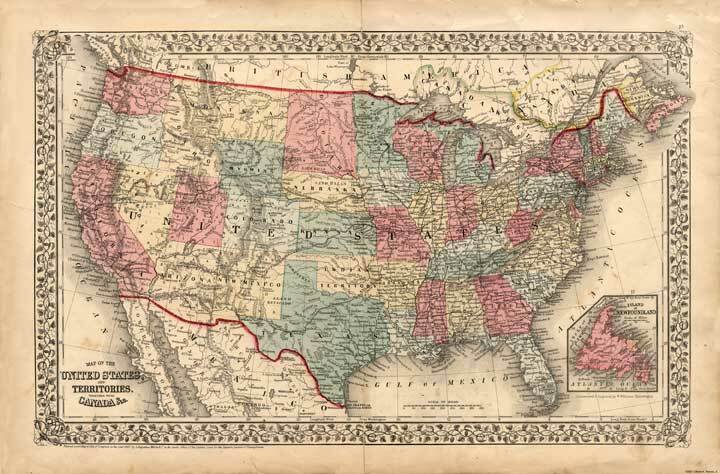 Created from a print at the Library of Congress Archives, 68" x 34"
A Map of the United States of America; By John H. Colton;1862. 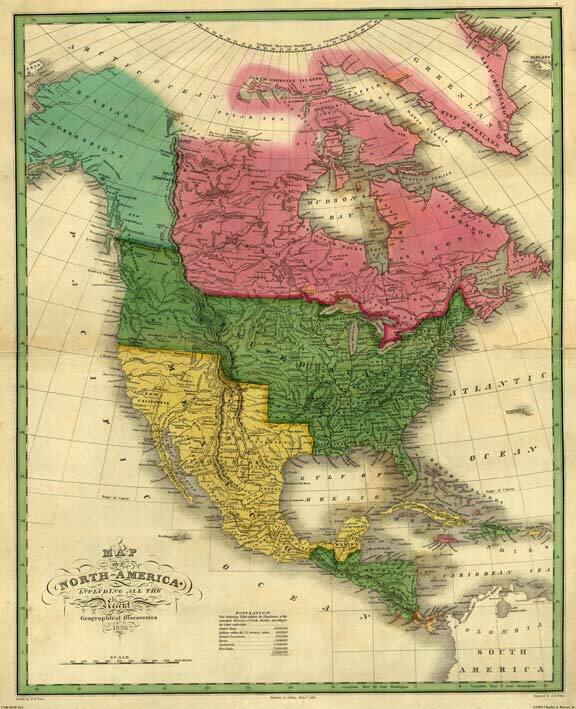 Created from a print at the Library of Congress Archives; 31" h x 41" w.
Johnson's Map of North America; from an original copy from the Illustrated Family Atlas of the World by Johnson & Ward, 1863; 24" h x 18" w.
Washington, D.C.; A. J. Johnson, Illustrated Family Atlas of the World, 1865. 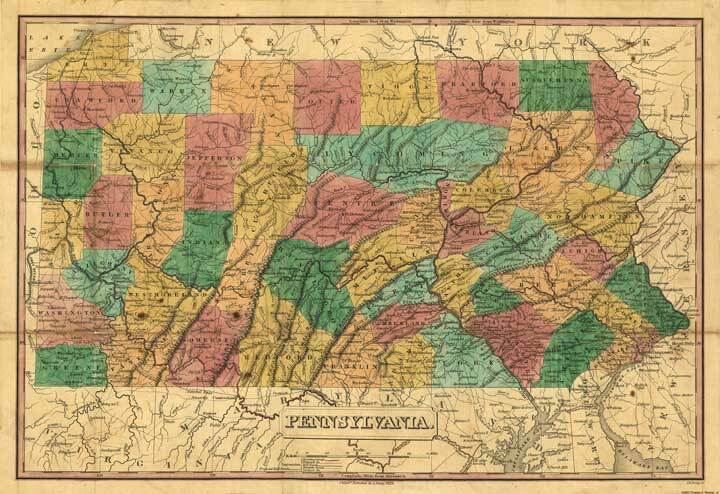 Created from an original copy; 20" h x 27" w.
Clarion County, PA; Pomeroy, 1865. 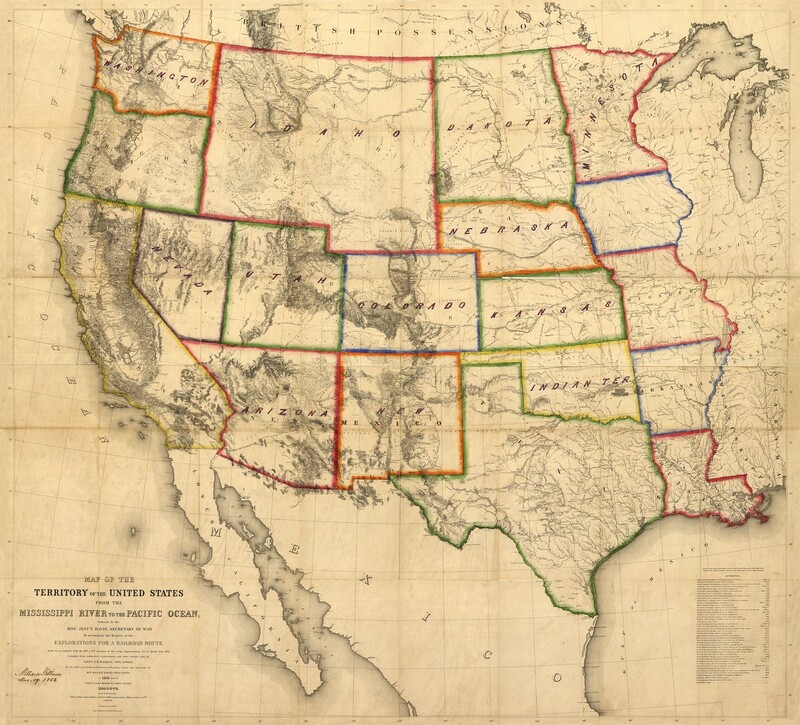 Created from a map at the Library of Congress; 51" h x 35" w.
Arizona & New Mexico; Mitchell. 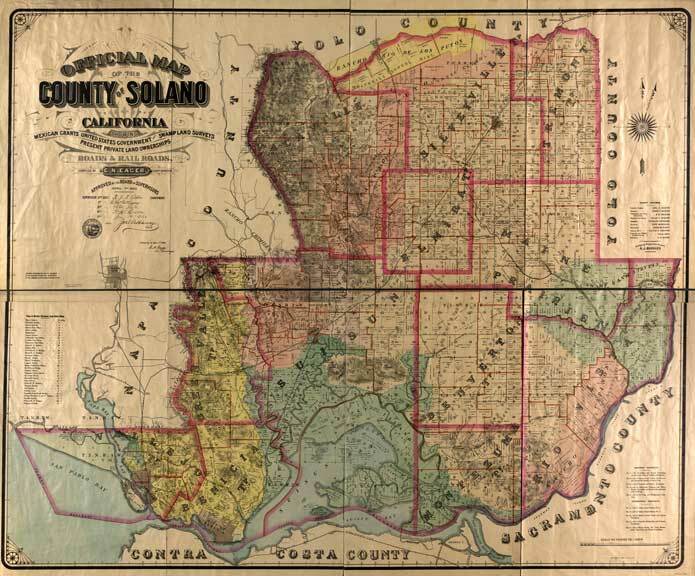 ; 1867. 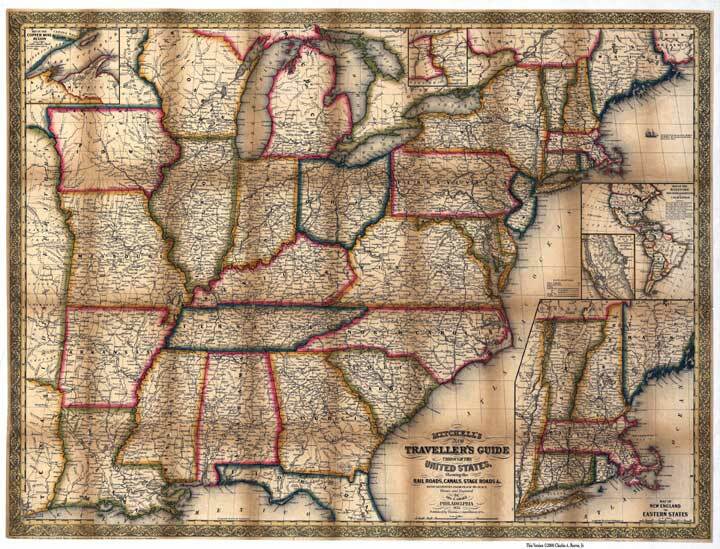 Created from a print at the Library of Congress Archives, 17" x 22"
United States; Mitchell. 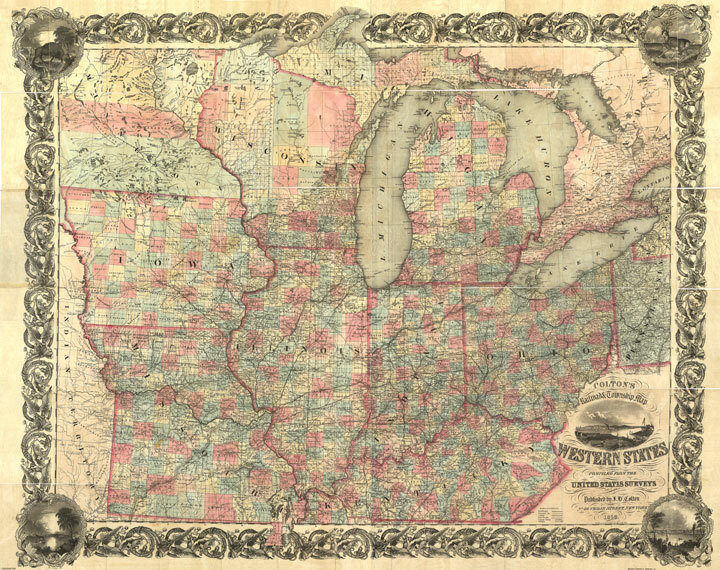 ; 1867. 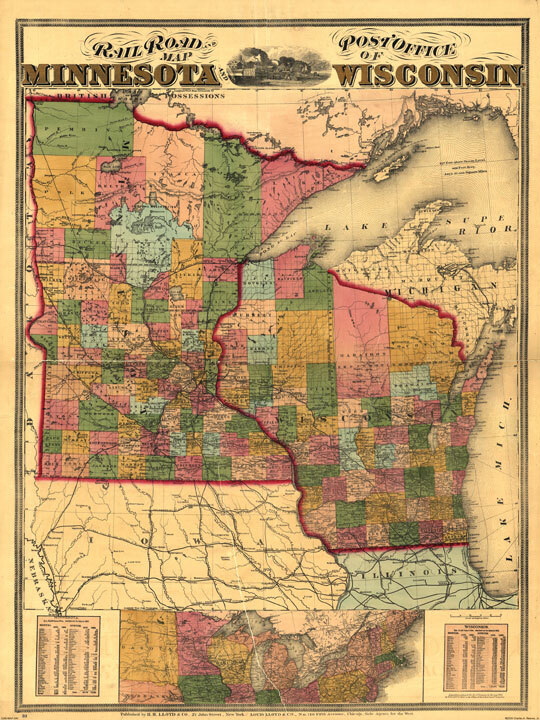 Created from an original copy, 16" x 24"
Railroad and post office map of Minnesota and Wisconsin; H.H. Lloyd & Co..; 1871. 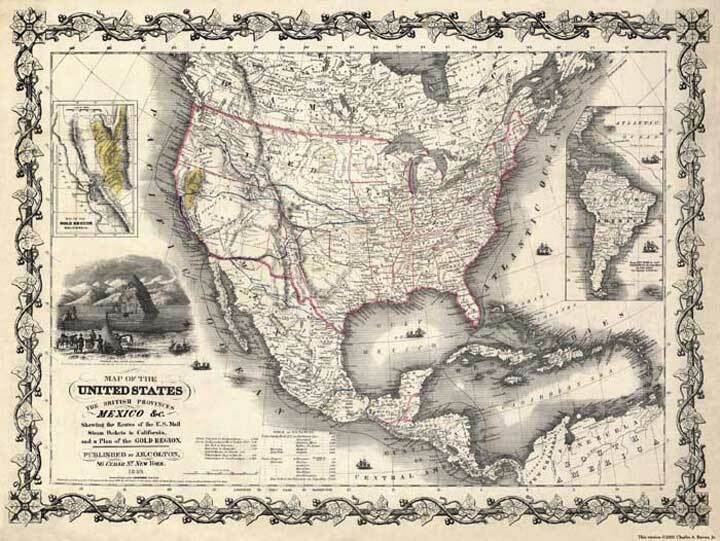 Created from a print at the Library of Congress Archives, 35" h x 26" w.
Los Angeles as it Appeared in 1871; Gores; 1929; from a copy at the Library of Congress Archives; 17" x 24"
Gray's New Map of the United States; Created from an original copy; 1879; 17" h x 22" w.
Massachusetts Railroad and Township Map; Williams & Co.; 1879. 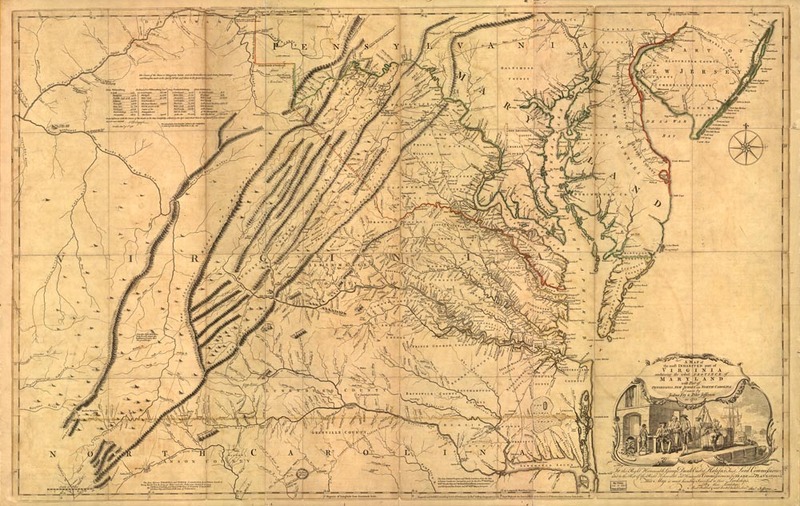 Created from a print at the Library of Congress Archives; 21" h x 32" w.
Palisades of the Potomac; H.W. 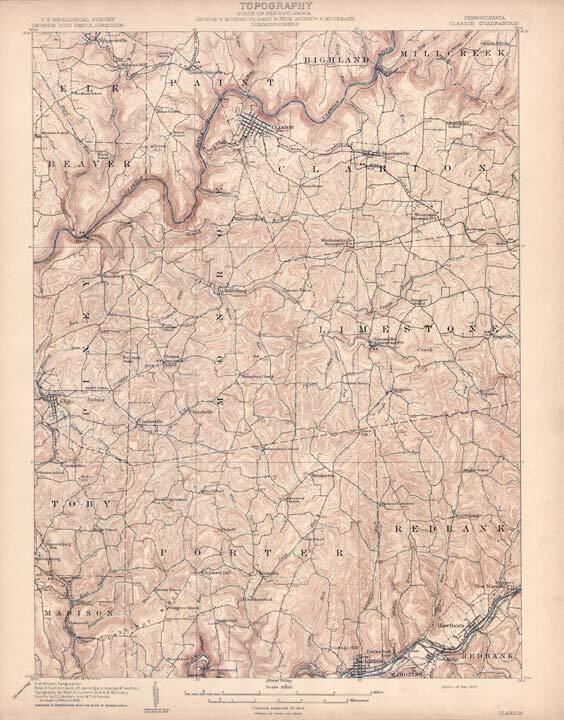 Brewer; 1890. 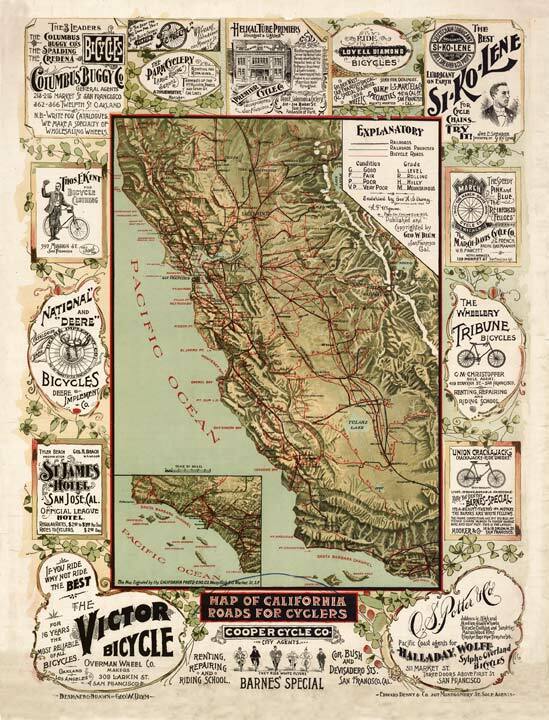 Created from a print at the Library of Congress Archives; 30" x 20"
Solano County, California; 1890; from a copy at the Library of Congress Archives; 42" x 51"
State, Country and Geographic Maps from the 1895 Edition of Rand, McNally & Co.'s New General Atlas. 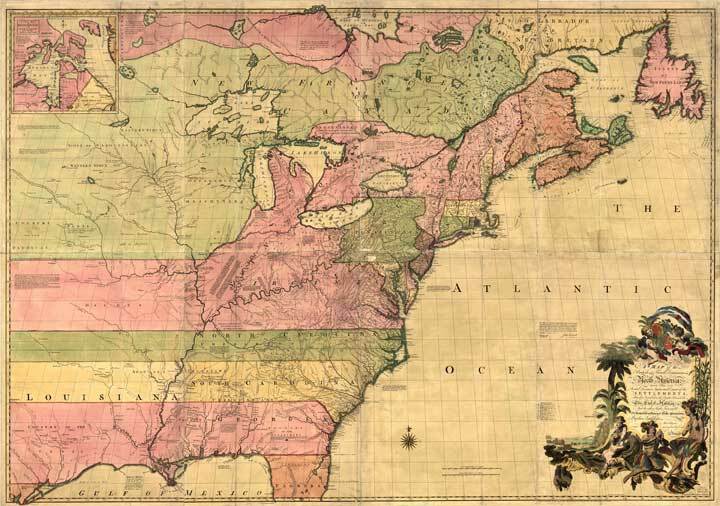 Click here to access the catalog of all maps in this atlas. 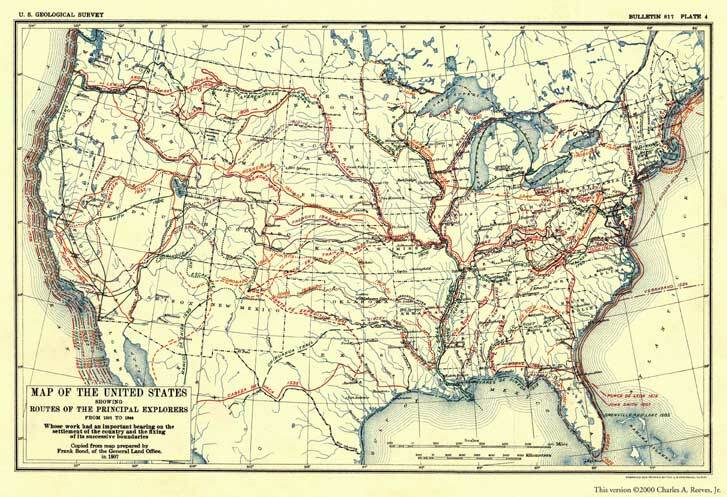 United States; The Century Atlas. 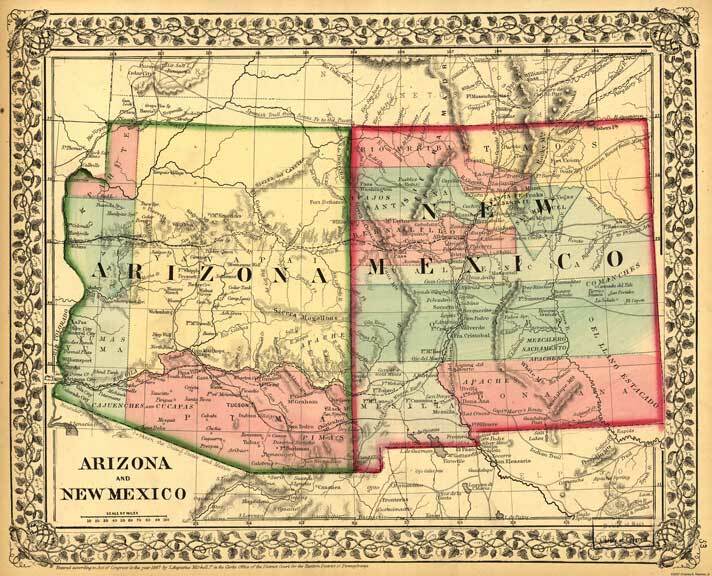 ; 1902. 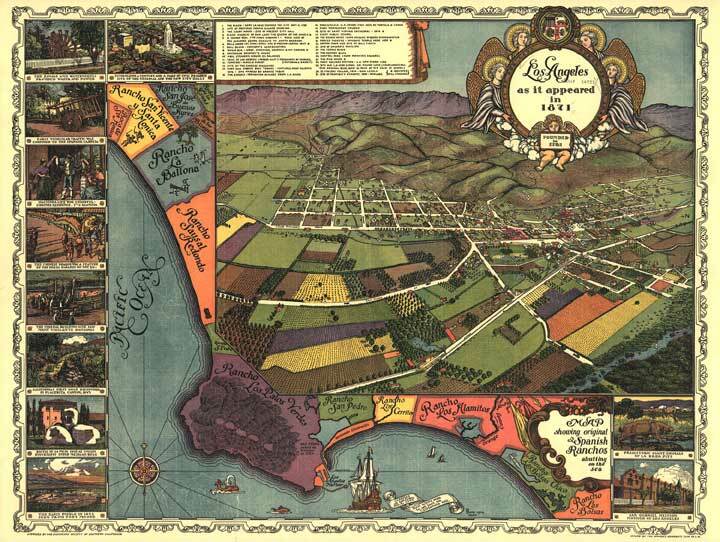 Created from an original copy, 24" h x 32" w.
Note: I have a complete copy of this atlas and can provide copies of any of its beautiful maps. Contact me for further details. 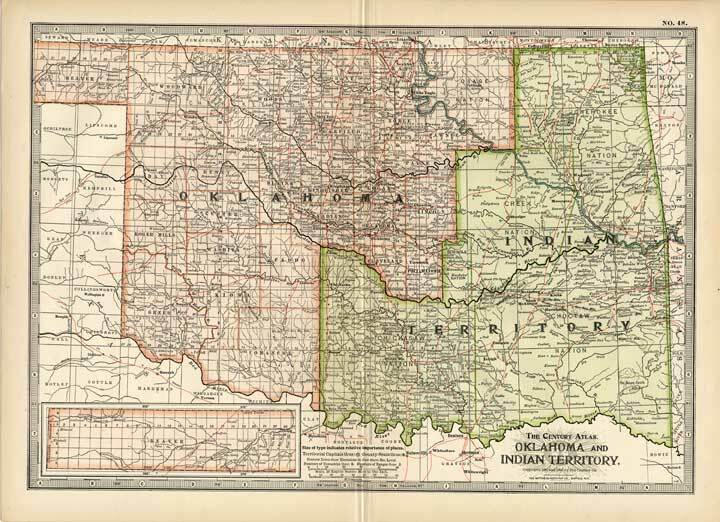 Oklahoma; The Century Atlas. 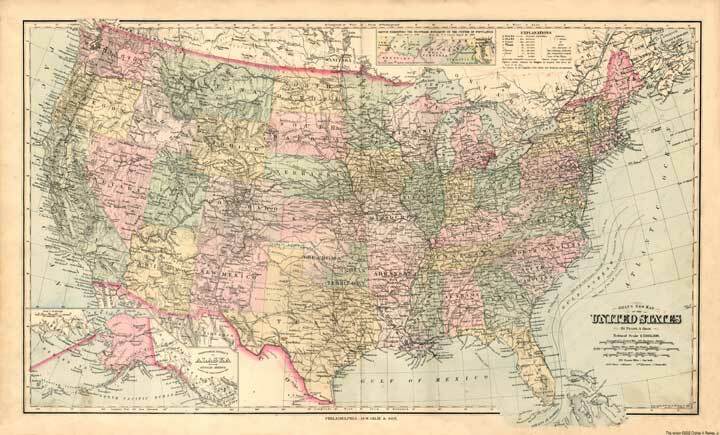 ; 1902. Created from an original copy, 17" x 22". 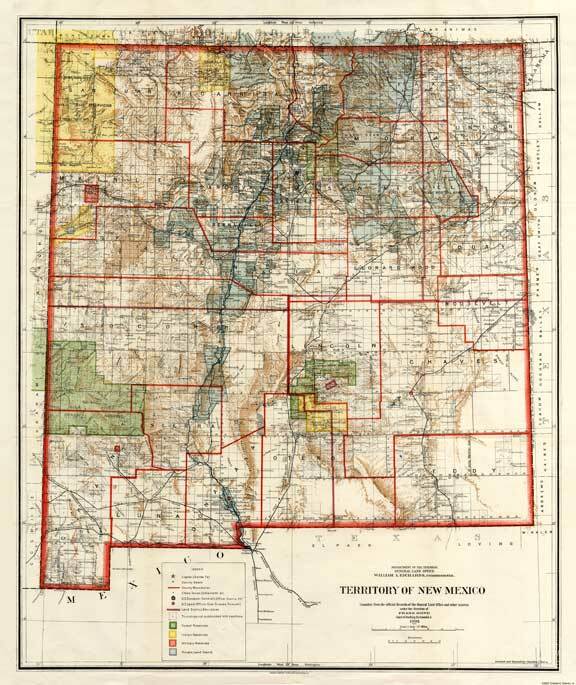 Territory of New Mexico; 1903; US Department of the Interior. Created from an original copy; approx. 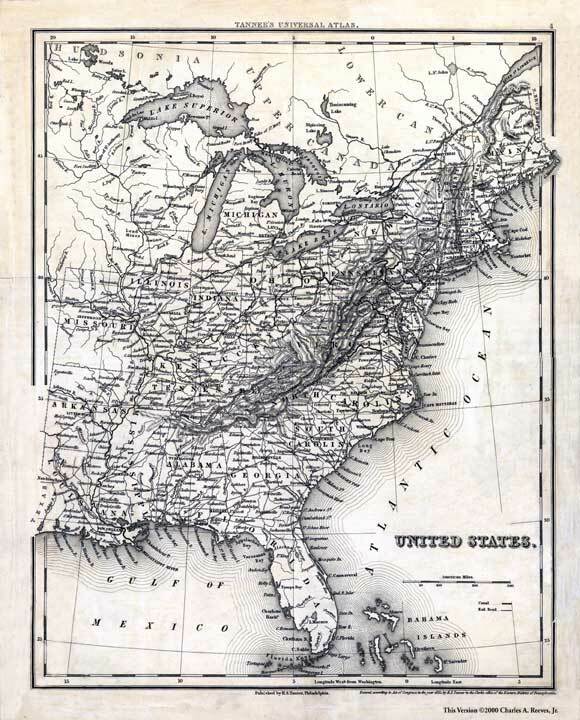 19" x 24"
Map of the United States showing routes of principal explorers, from 1501 to 1844; published by Frank Bond; 1907. 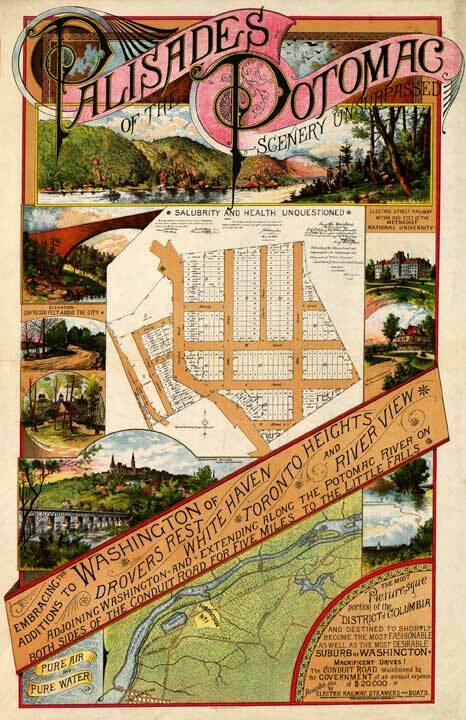 Created from a print at the Library of Congress Archives; 8" h x 11" w.
Return to the ReevesMaps Home page. The entire contents of this page copyright 2000, 2001, 2002, 2006, 2007, 2012, 2013, 2014, 2016 Charles A. Reeves, Jr. This page last updated February 13, 2016.